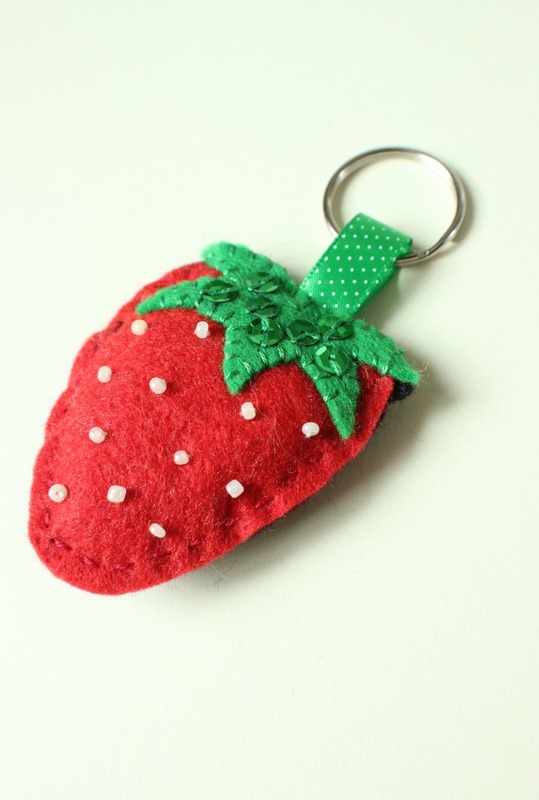 Just a quick one to let you know that my Etsy shop now has stuff in it! Woohoo. It’s been a while. 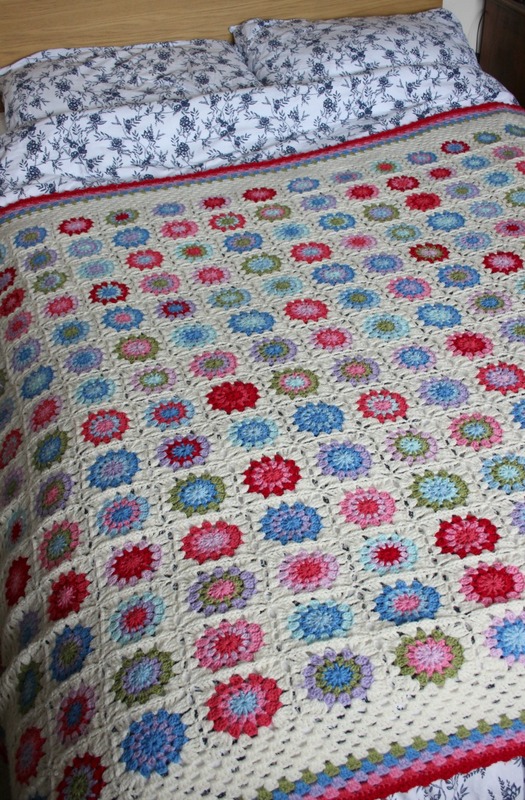 All my blankets are up and I’ve added some other bits and bobs too. I’ve run out of time for today though so I will have to try and get some more up tomorrow. Now that I’ve done this, I’m starting to think maybe Folksy would have been a better option!? Oh, I don’t know. Let’s just see how this goes. I’m in absolutely no rush. Zeens and Roger on Etsy. If you ever need to find the link to my Etsy shop, it is also in my Contact page and my About page. Cheers. 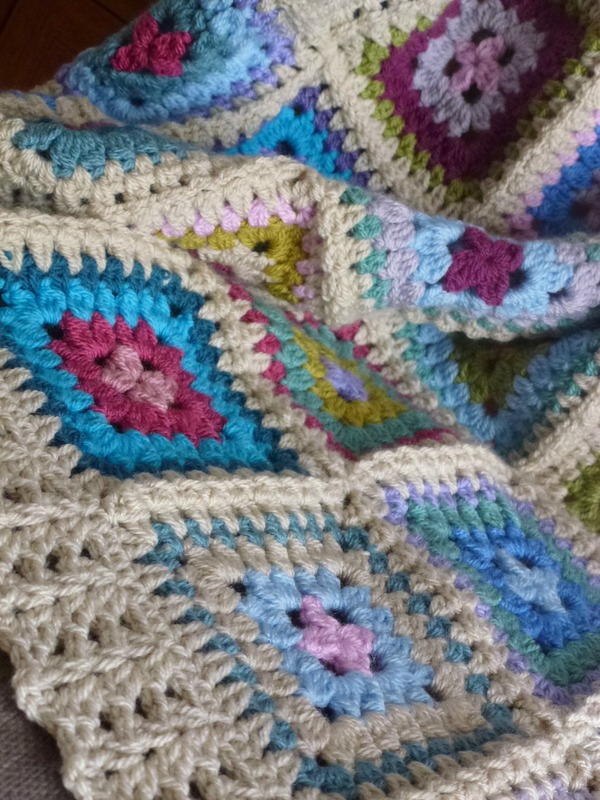 A New Crochet Blanket. 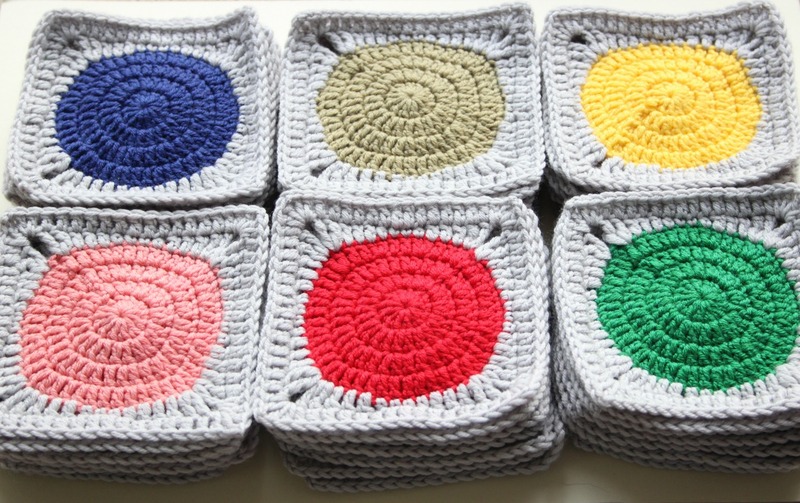 Circles in Squares. 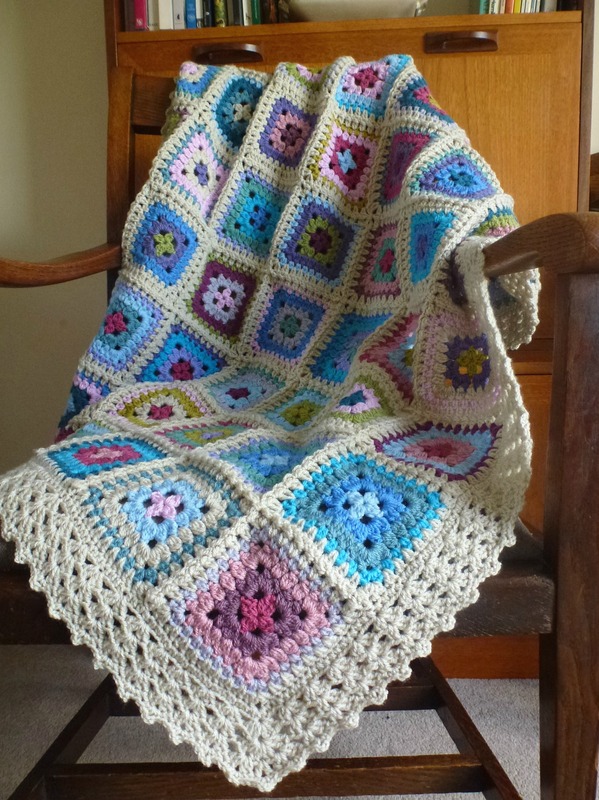 I finished this little crochet blanket about a month ago. It now belongs to a baby. It is not my baby but a new cousin for my boys. 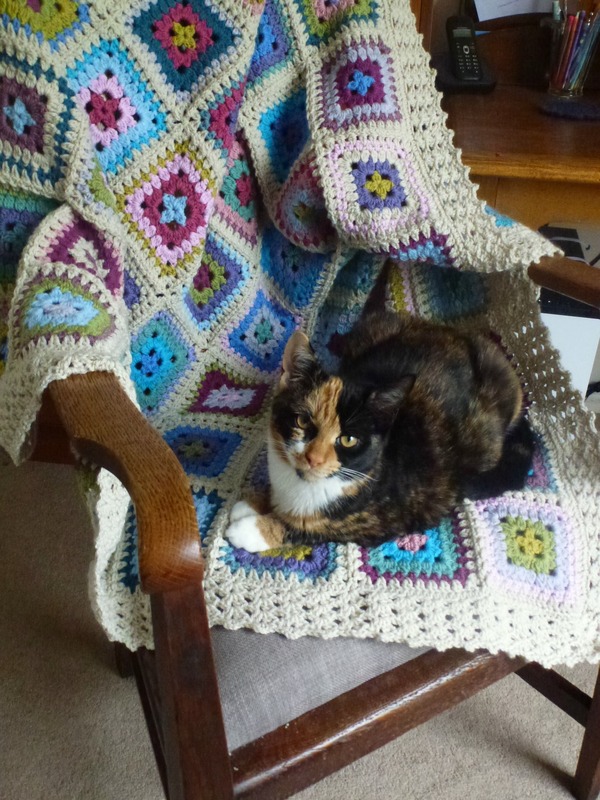 I’m pleased that she has already had snuggles in her lovely new blanket. 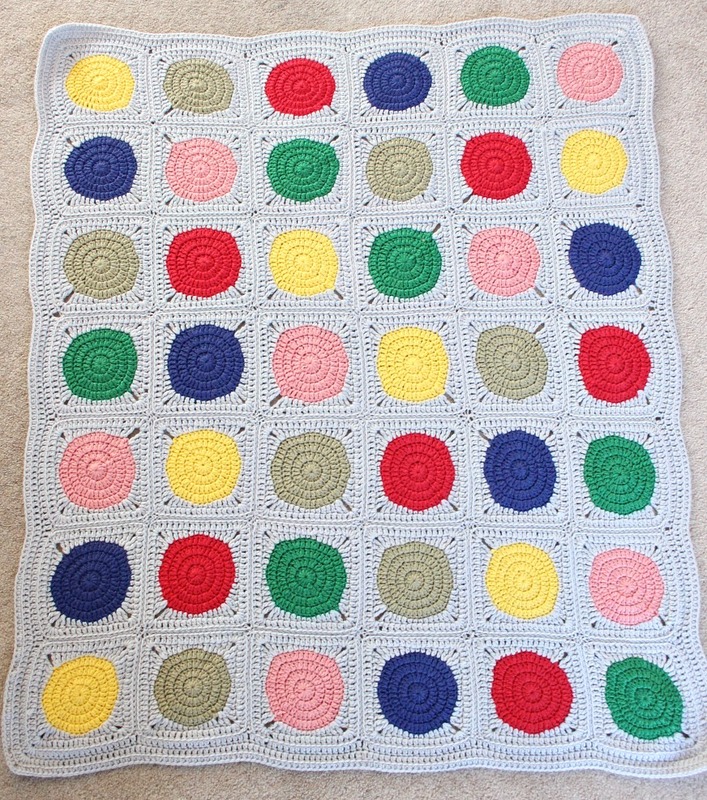 A Circles in Squares blanket! 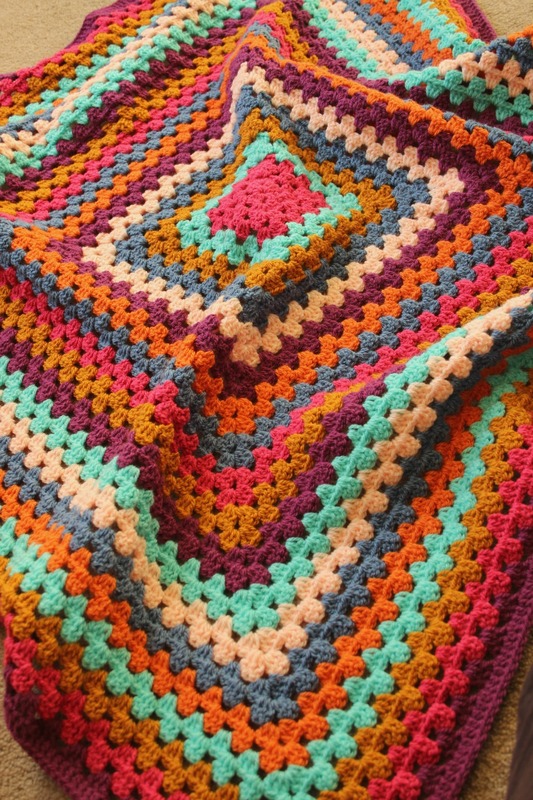 I chose to make the blanket with Scheepjes. I really wanted to get my mitts on this brand. A couple of months ago it seemed like loads of people were using it and I wanted to join the fun. 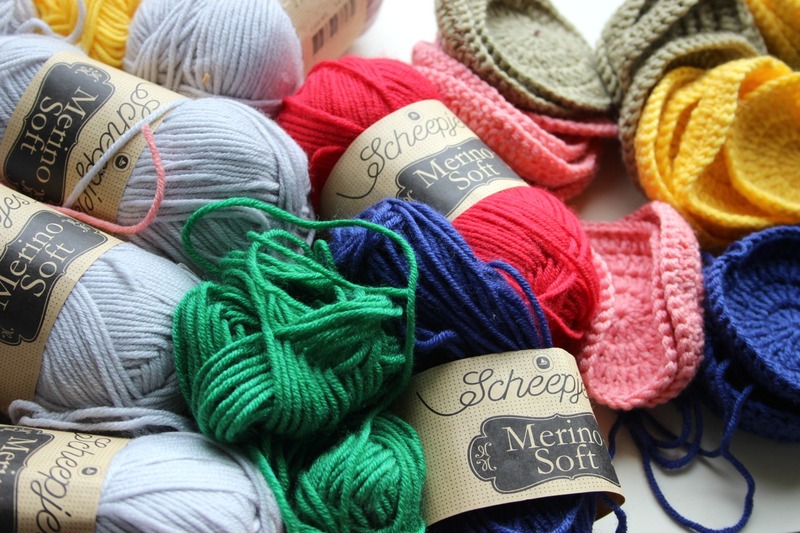 I liked all the colours and I wanted something super soft so I went with the merino (which also has microfibre in it). It is the softest, squishiest yarn. It is also quite splitty, which surprised me. 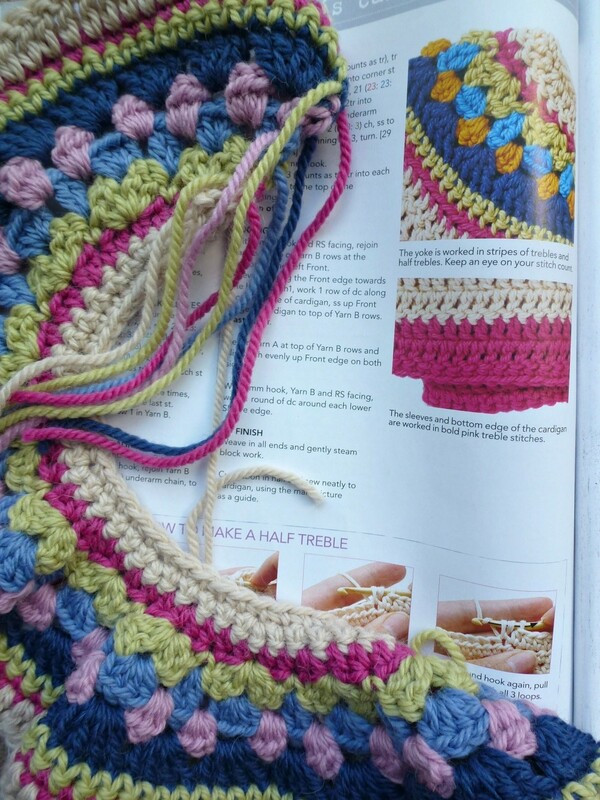 I find that once I get into a crochet rhythm I can avoid most of the splittiness, whichever kind of yarn it is. However, it’s still disappointing when it happens. When I heard that there was to be a new human on the horizon, I asked my sister-in-law what sort of thing she fancied. 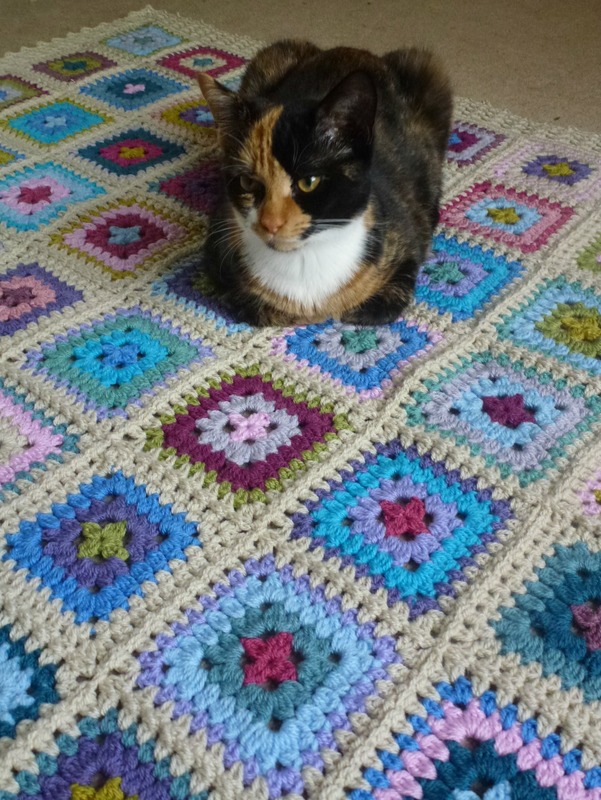 I knew I wanted to make a blanket but I didn’t want to make one that wouldn’t fit in with her tastes. All that effort and they don’t like it? No thanks. 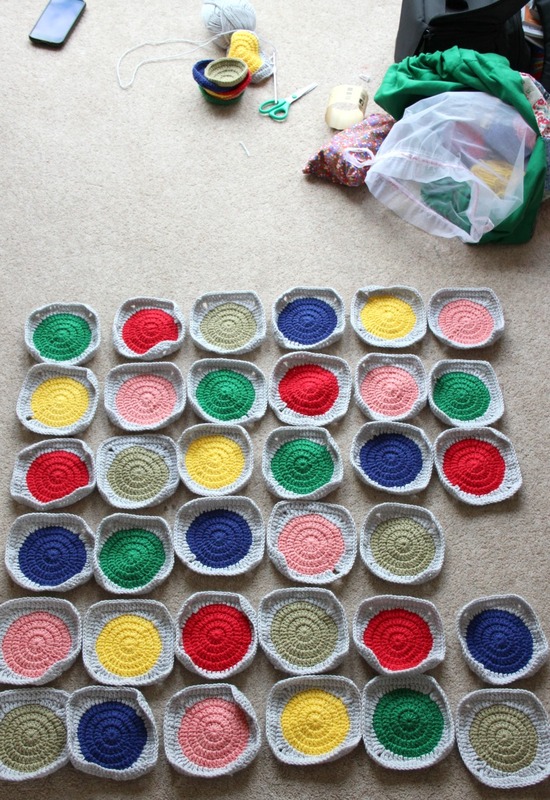 She gave me a photo of a cushion that fitted with the nursery colour scheme. The cushion had a bunch of bright circles on it . That was enough inspiration for me; off I went. I blocked it (badly). It didn’t work. They all pinged back after 5 minutes. I thought they’d be good because of the merino but I’m guessing microfibre does funny things. These squares were about as flat as they got and they quickly started to curl at the edges again. Oh well. 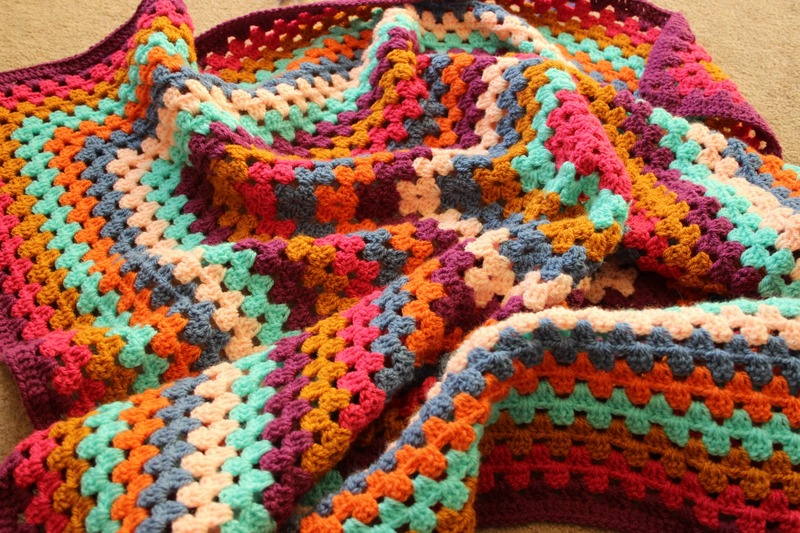 Each time I make a blanket I have great fun laying them all out. 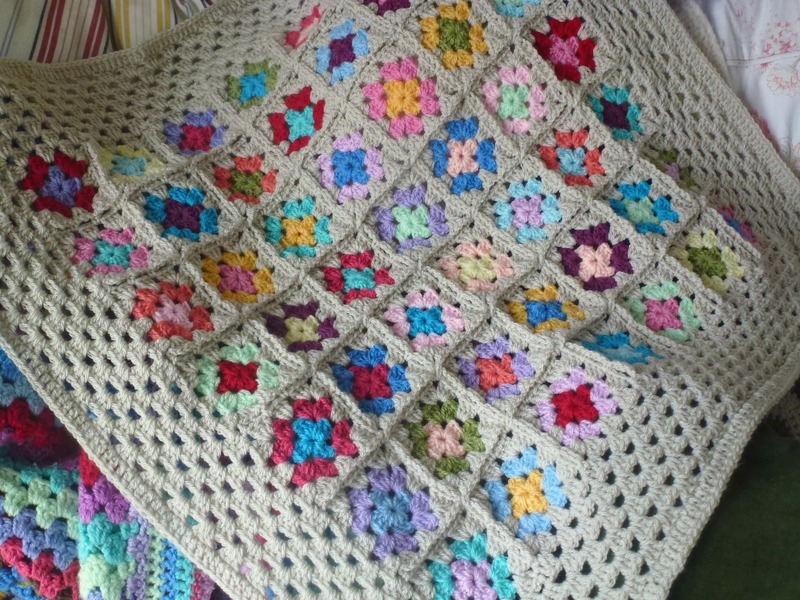 Once I have more than a few squares I do it over and over, each time adding a handful more of newly stitched squares. I think I had another row to go at this point but couldn’t wait to see what was going on. I got one ball of each colour for the circles and thought six would be enough for the main colour. Eight balls. Eight balls next time. 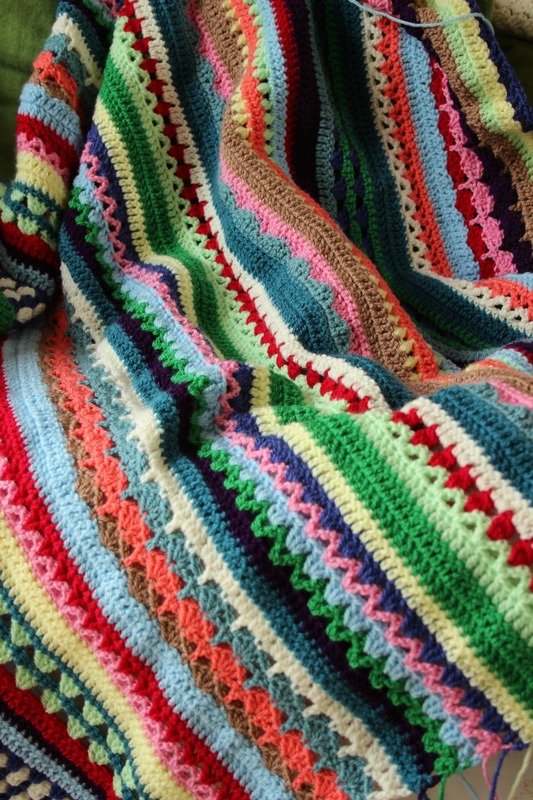 I’m finding it increasingly difficult to take new and interesting pictures of blankets. 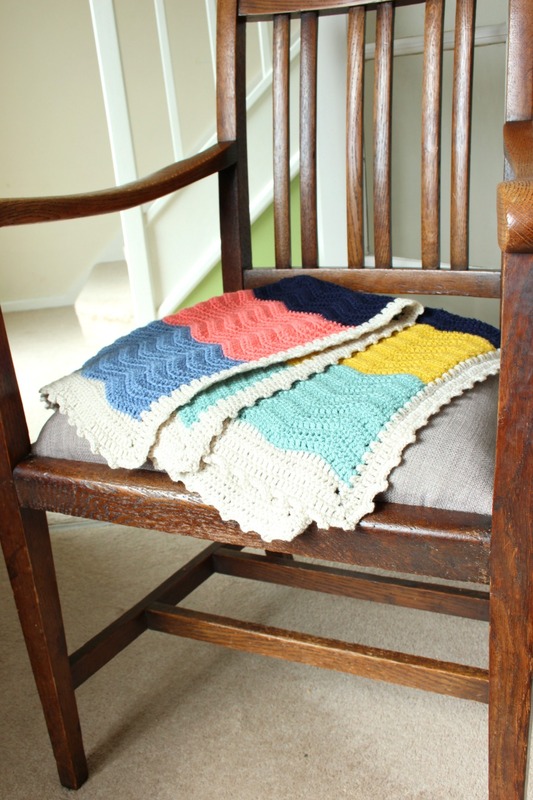 They all end up draped on the same two chairs in the same locations! I can tell you that I never spot wires, plug sockets and other such things in Pinterest pictures. They jump out a mile in all my photo’s no matter how hard I try to avoid them. Photoshop! We used to have a very early version of photoshop (not that I knew how to use it) on the old mac but the mac choked to death on carpet fluff. Be mindful of computers when getting new carpet! I made up the pattern although I know many similar ones exist. I’m afraid to say I have not written it down yet. 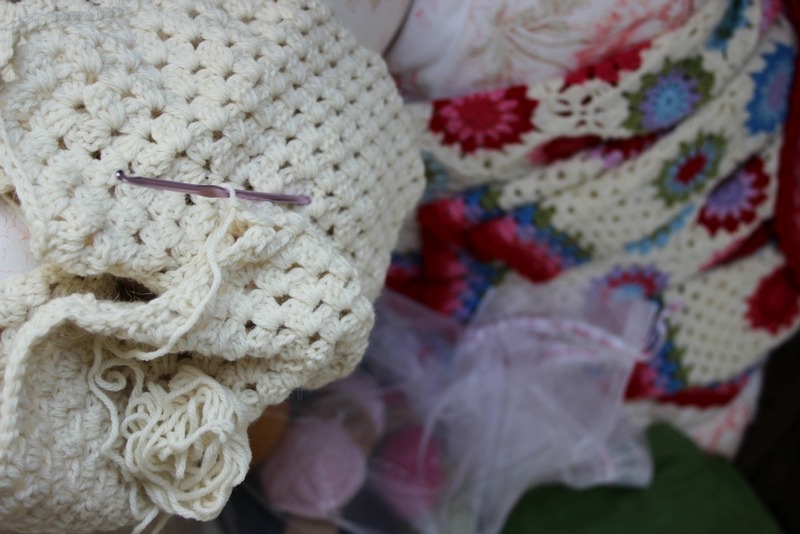 I took photographs of all the making stages but I actually don’t like them! I can do better. 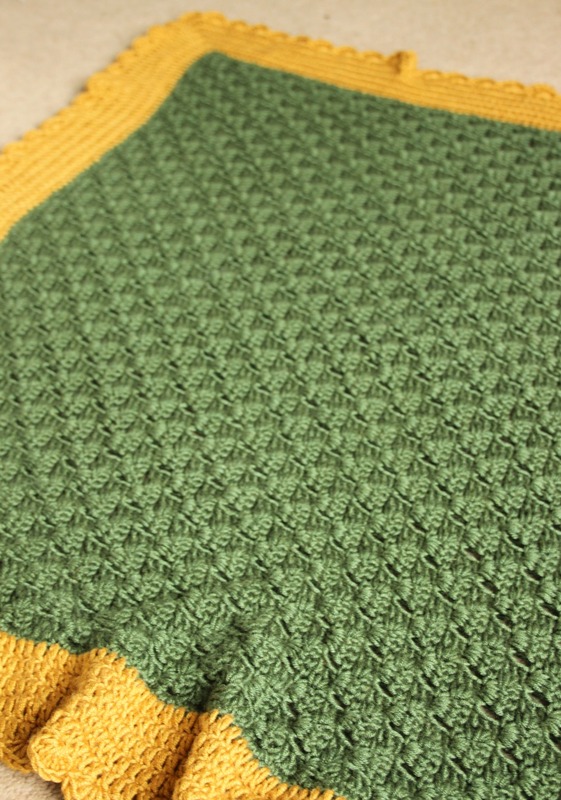 Sooo at some point in the near future, I will come back with a post about how I made the squares. I did some experimenting with starting the rows as I wasn’t happy with a messy 3 chain start. I think it’d be interesting to do some comparisons etc but it’ll have to wait until another day. Anyway, I must go and wake up the little one, he fell asleep in the car on the way home from food shopping. He didn’t even wake up when I moved him to the sofa. Silly boy has been up since 5.40am. I’ve linked up with Crafting is my Therapy. 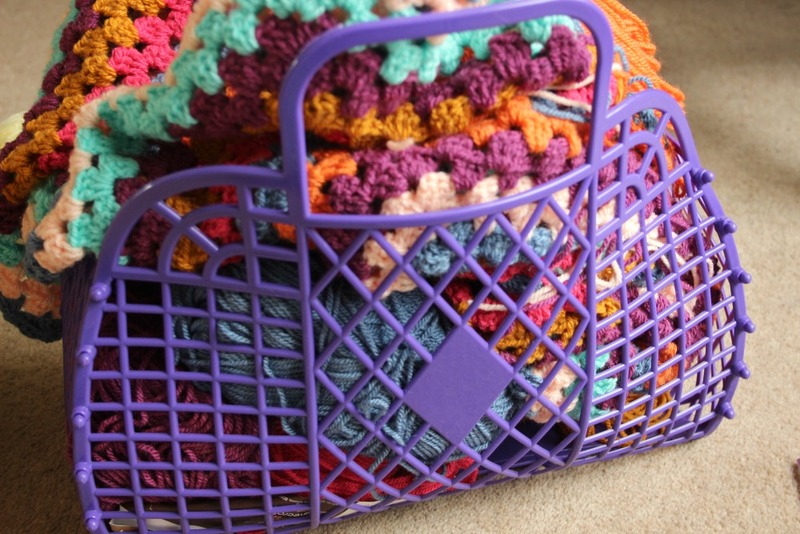 A place for sharing crafting blog posts! I think this is one of my favourites. A blanket just for me! 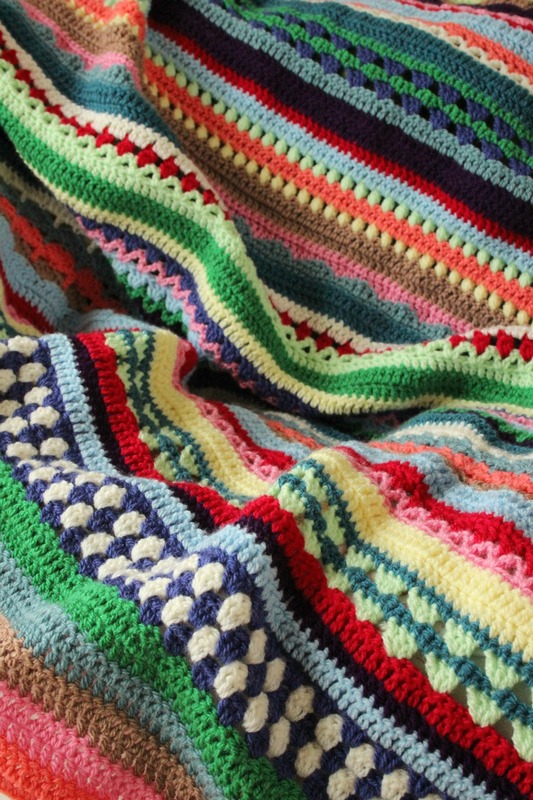 I am really surprised that I Iove it because most of my finished blankets tend to make me feel a bit meh. It’s usually to do with not turning out how they looked in my head, so they get abandoned or I give them away. 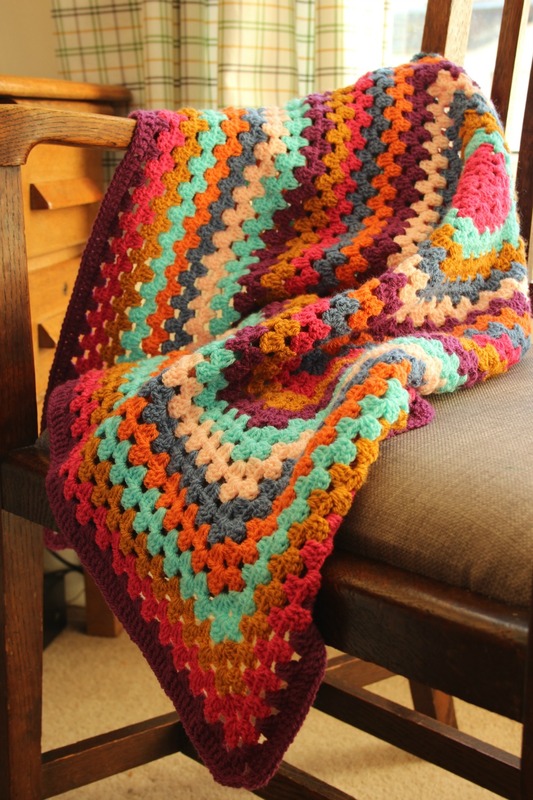 The stitch used is the Stacked Shells section of Cherry Heart’s Spice of Life blanket. Sandra herself did the same thing and I liked it even more than the SoL [my SoL]. I’ve totally copied! It’s called A Touch of Spice and I really love it. 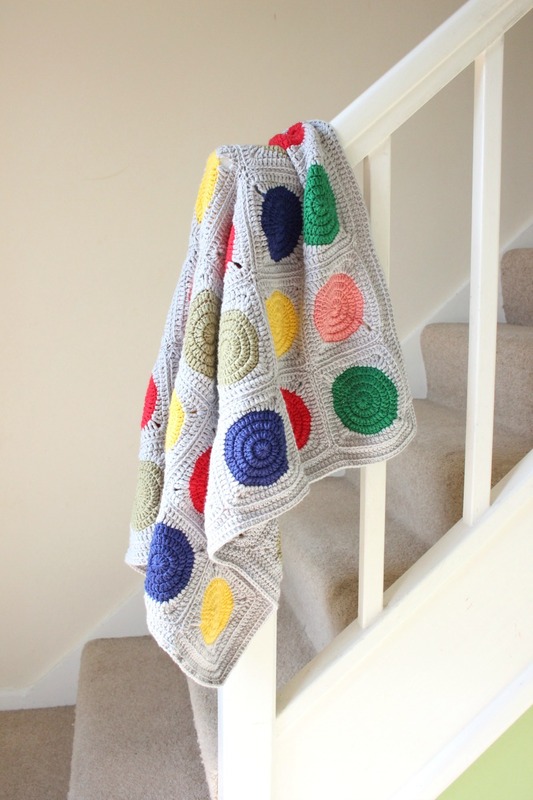 The bobbly pompoms are my absolute favourite bit. I love the red and I just think they’re fabulous. I was super proud of them because I made up the pattern myself. Well, I thought I had until I started checking out other places on t’interwebs. 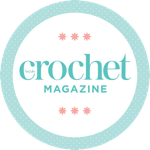 I’d found a couple of patterns and tutorials that had really faffy ways of crocheting pompoms, that I just couldn’t be bothered to do. I did try. 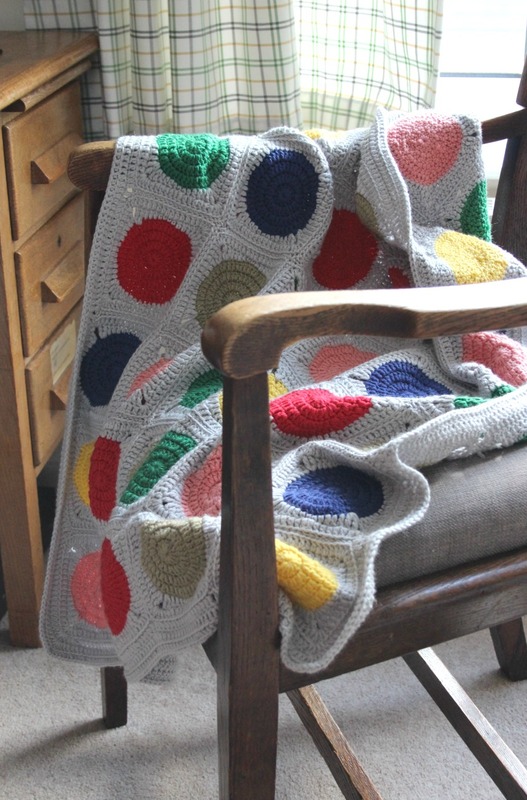 Every pompom took an age and it would have taken a lifetime to go round the whole blanket. My reaction to that was to come up with my own cheaty pompom. However, someone else has too, I discovered via Pinterest. Oh well. On the plus side, I have discovered a delightful blog! Since I’ve already taken some photographs I’ll put up the method of how I made my pompoms. It must happen all the time. It does happen all the time. Have you had this kind of experience? 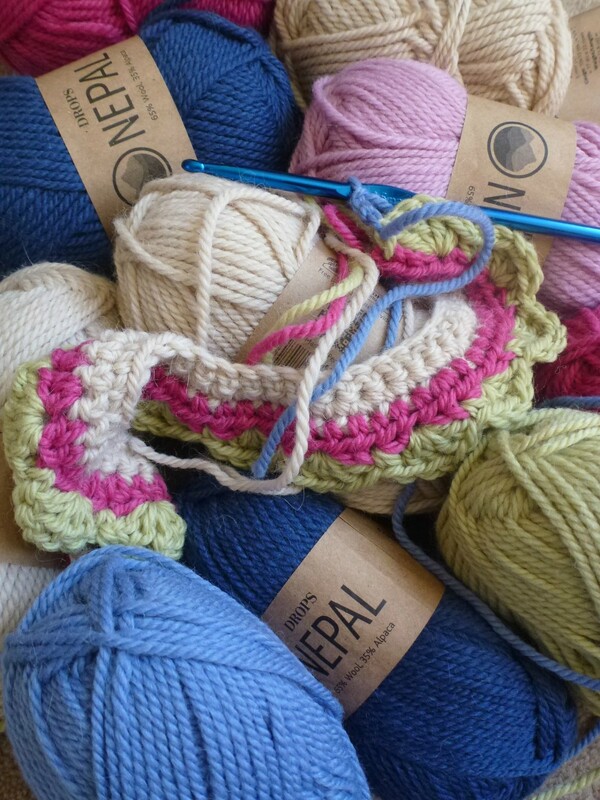 If you’ve come up with a new idea/pattern, do you check out whether or not it has been done before? 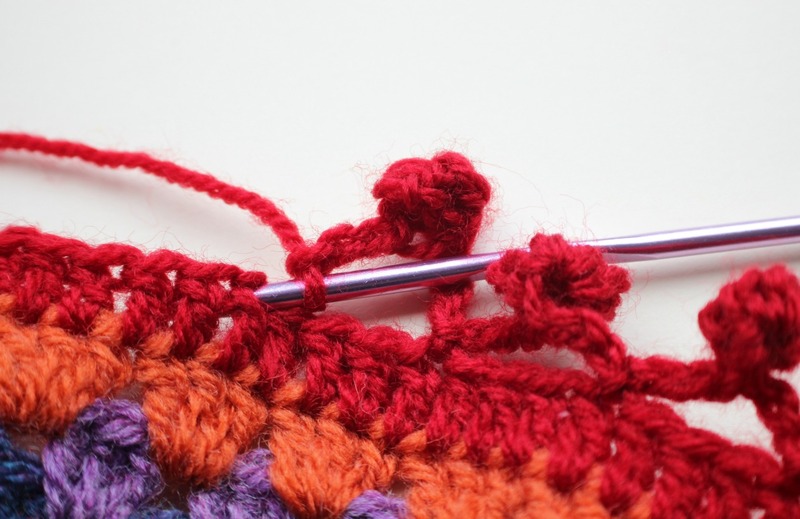 Yarn over (YO) hook, insert hook in stitch (st), pull up a loop, 3 loops on hook. YO hook, pull through 2 loops, 2 loops on hook. YO hook insert into st, pull up a loop, 4 loops on hook. YO, pull through 2 loops, 3 loops on hook. YO hook insert into st, pull up a loop, 5 loops on hook. YO, pull through 2 loops, 4 loops on hook.YO hook insert into st, pull up a loop, 6 loops on hook. YO, pull through 2 loops, 5 loops on hook. YO pull through last 5 loops. (I think this is correct. Tricky to write down, that’s for sure). *Ch7, 4tgr in 4th ch from hook, ch1, ss into bottom of cluster, ch3, skip 3 st and ss into next st.* repeat around. Photo 2: Beginning the 4trb cluster. Photo 3: Before yarning over and pulling through last 5 loops. Miss 3 stitches. 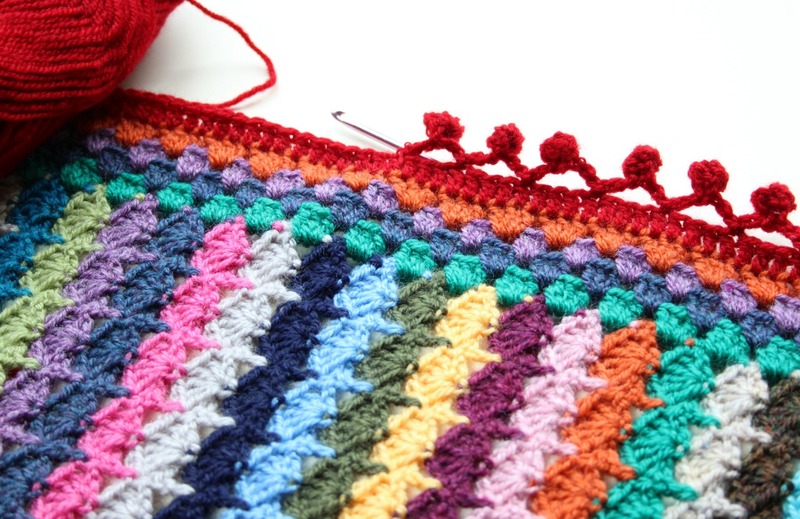 Slip stitch into 4th. Repeat all the way around. Fasten off, sew in ends and admire. 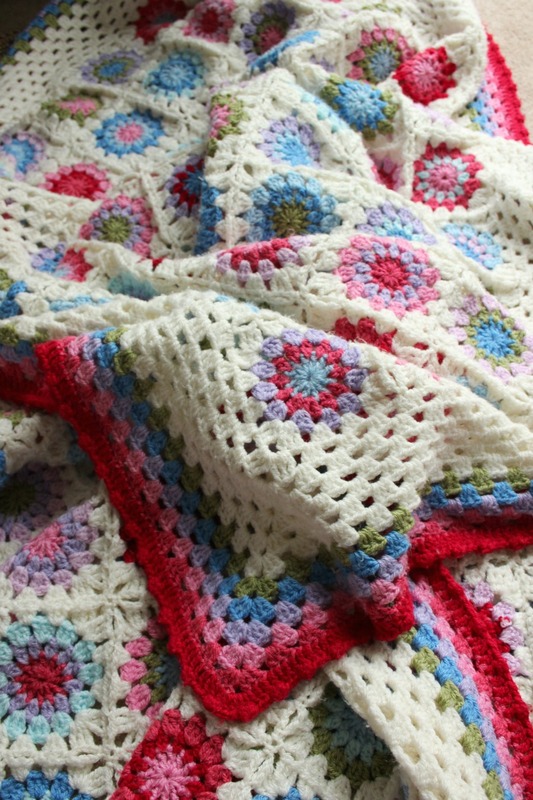 Amazingly for me, I blocked the blanket. I pinned it directly onto the carpet because I don’t have any spongey foam boards. It doesn’t seem to have ruined the carpet. I sprayed it lightly with water and left it over night. By morning it was dry (It was near the radiator). 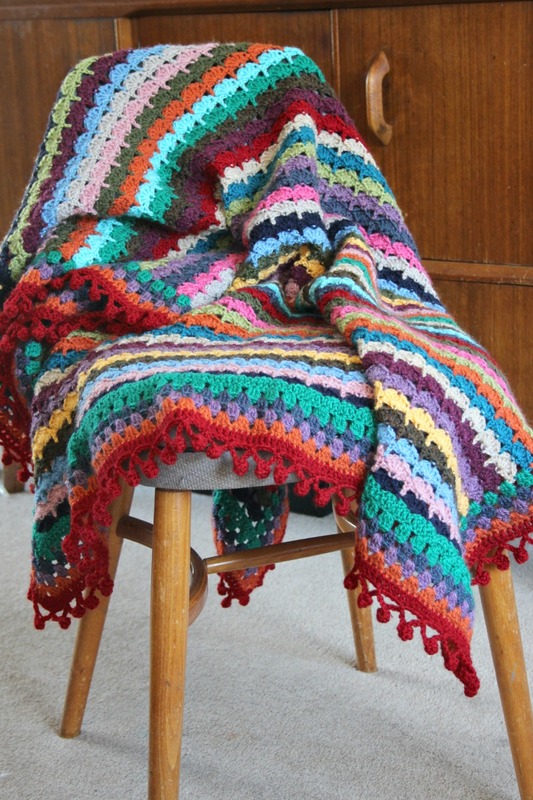 I have draped myself in it every evening since I finished it last week. It’s lovely. Anyway, that is that. Sewing stuff next I think. Maybe some Jedi robes for the boys, slightly different. And I’ve dug out some paper piecing hexies, which is a very old, ongoing project. 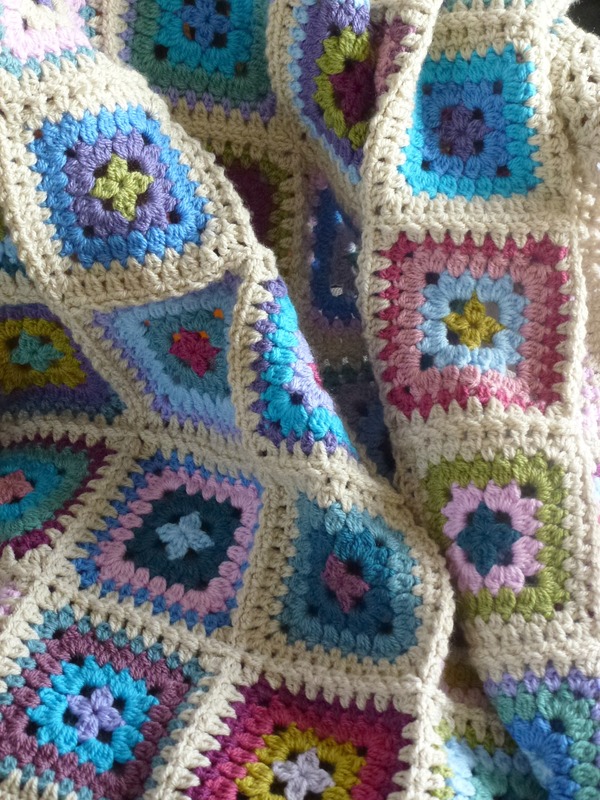 Started three Sundays ago, I sewed in the last end of the Spice of Life blanket on Saturday night. 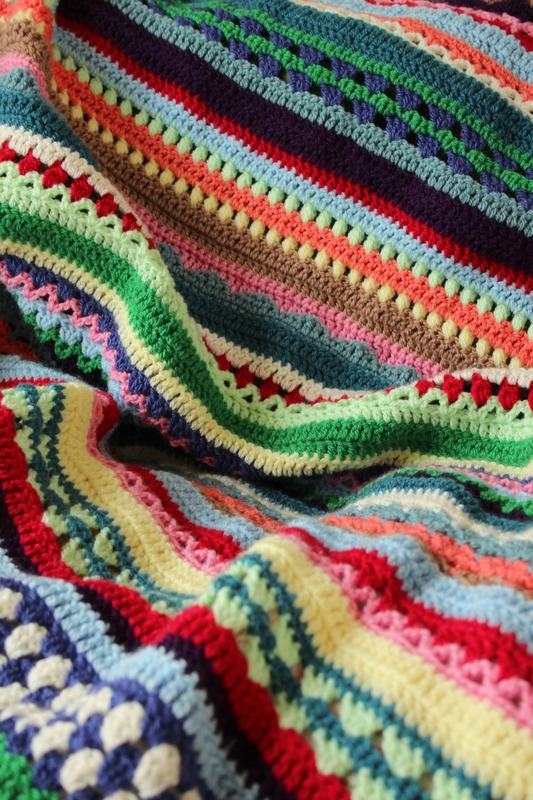 I didn’t know where this blanket would end up for the first few days of making. Then all of a sudden I knew it would make a great birthday present for my Nanna and Grandad. They both had their 90th birthdays in January and on Sunday we had a lovely family birthday party. Stylecraft Special DK is the yarn. 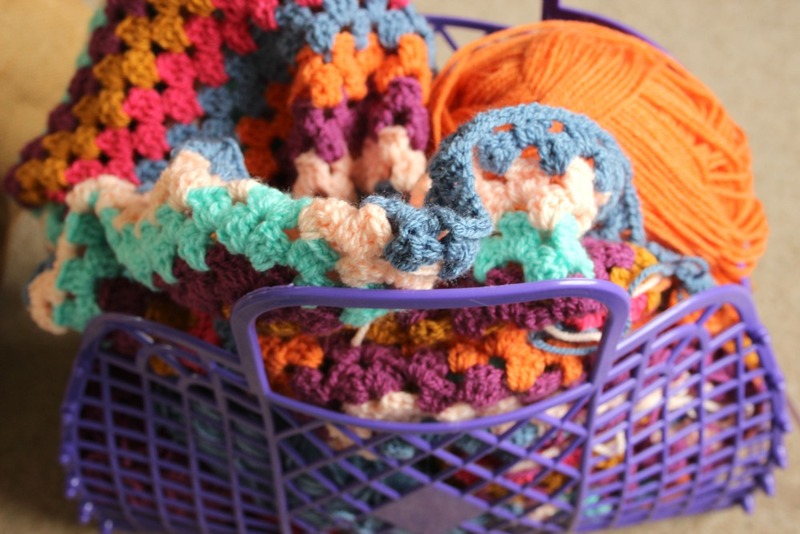 I loved the Spice of Life Rico colours that you can buy as a pack for making the blanket but I couldn’t justify spending any more money on yarny things when I had loads stashed away already. 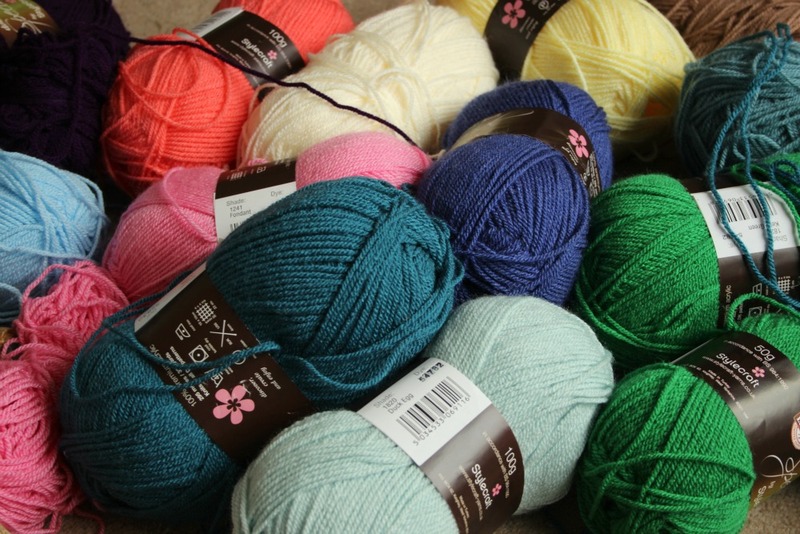 I only needed to buy a couple of balls to make up the colour palette, which consisted of: Cloud blue, Storm blue, Cream, Lemon, Mocha, Lipstick, Emperor, Fondant, Shrimp, Kelly Green, Lobelia, Petrol and Spring Green. 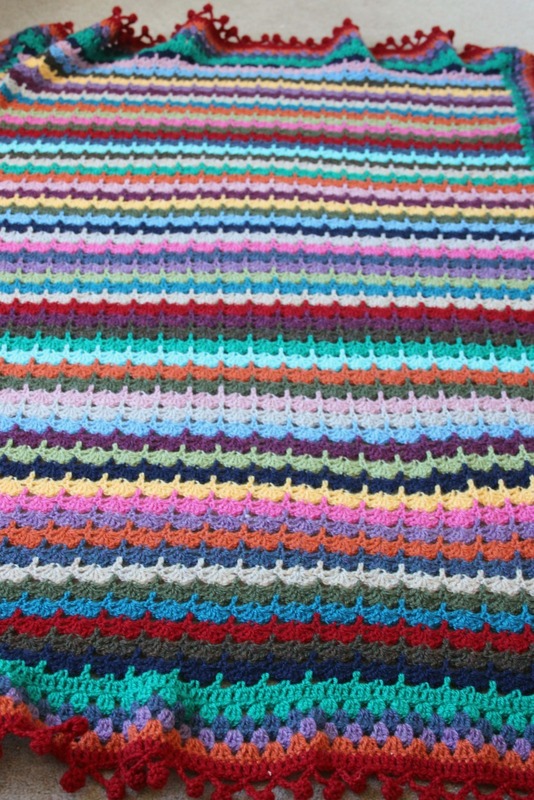 I looked at the original Spice of Life blanket and matched the colours as closely as I could. My eyes tell me that the Stylecraft colours are a lot more vivd and bright than the Rico stuff (not that I’ve seen the Rico in real life). 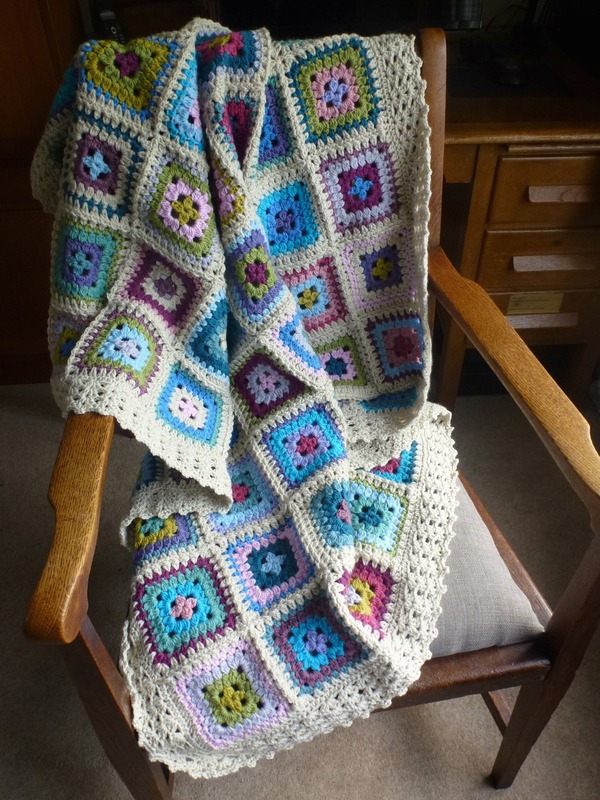 I downloaded the pattern from Ravelry via Cherry Heart (one of my favourite blogs) and off I went. I went wrong a couple of times and had to do some unravelling. There were a couple of other mistakes I made without undoing it. I am hoping that they go unnoticed. 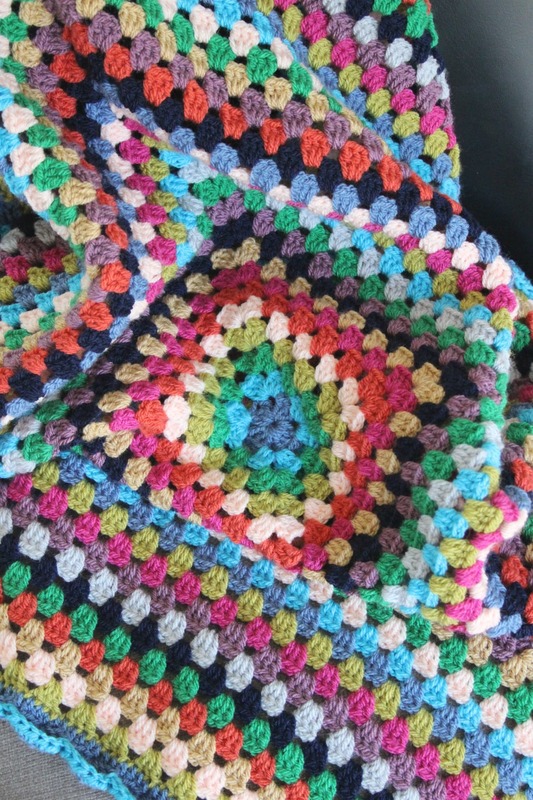 I had to crochet in the car on the way to Southampton (about 2 hours from home). 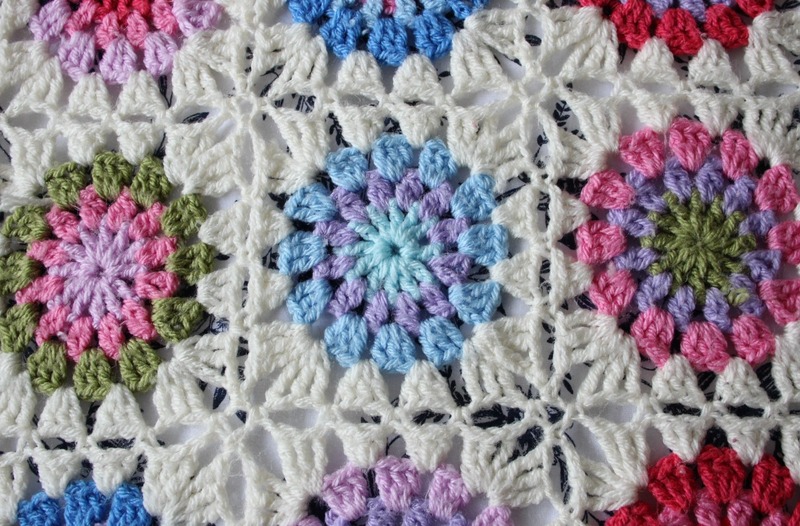 And I added the final row of the border at my mum’s house. 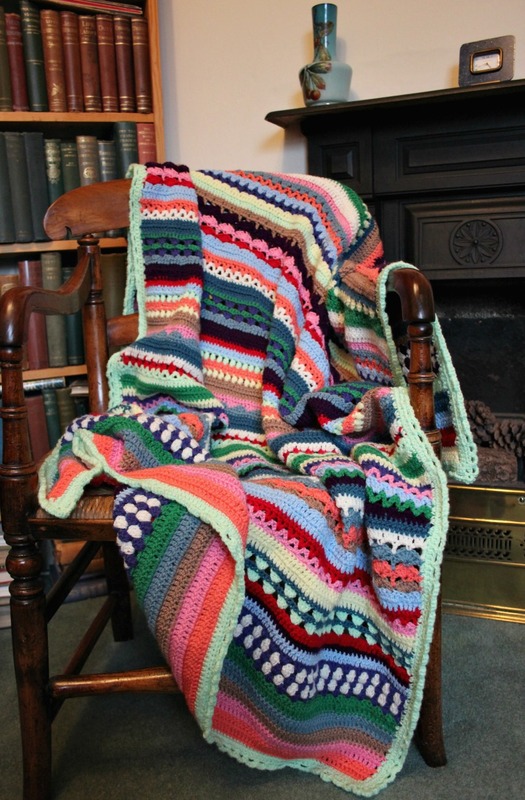 I tried several times to get a good photo of the finished blanket but the weather was grey to the extreme. Rainy, cloudy skies and one hundred year old windows did not help. I put the pictures in a collage rather than spread the dismal grey. 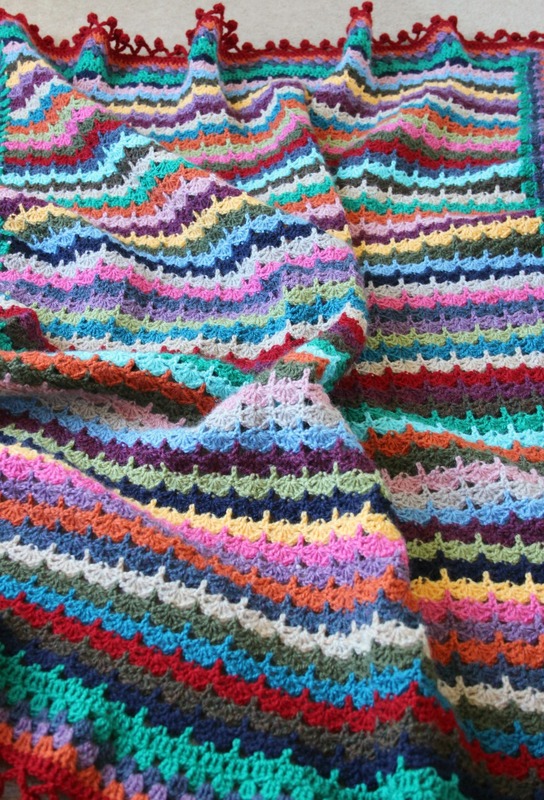 The blanket is actually one of the brightest I’ve ever made. I’m glad it was for a present for some old people, their eyes are rubbish. 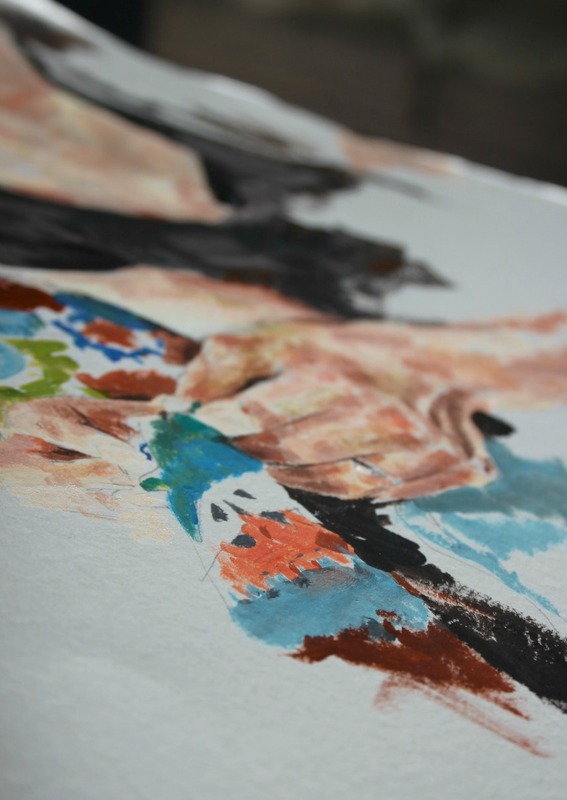 Above is a painting of my hands as they sew in the ends of the blanket last Friday. My artist friend is painting my portrait! I’m finding the process lots of fun. I’ve said she can paint me any way she wants. Unfortunately, that means she wants me to take my clothes off. That certainly isn’t going to happen in February. Too cold. Anyway, more about that another day. 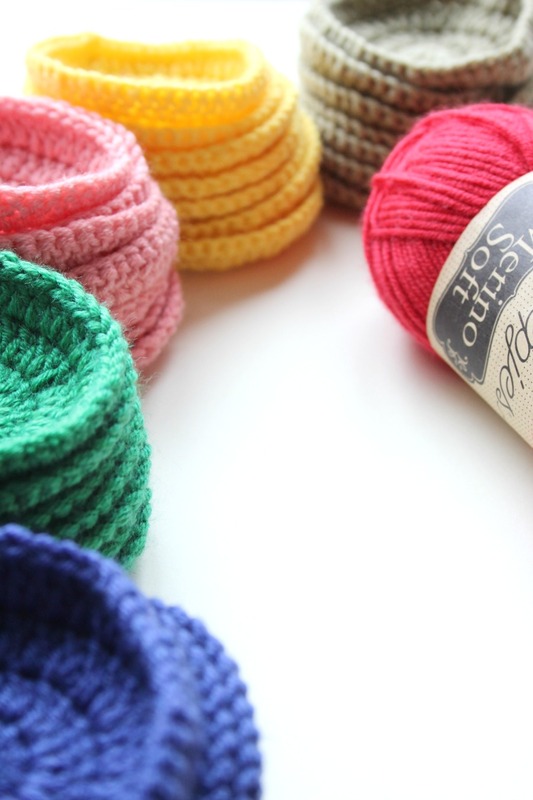 This week I’m trying out some very basic knitting next. Hone my skills and all that. 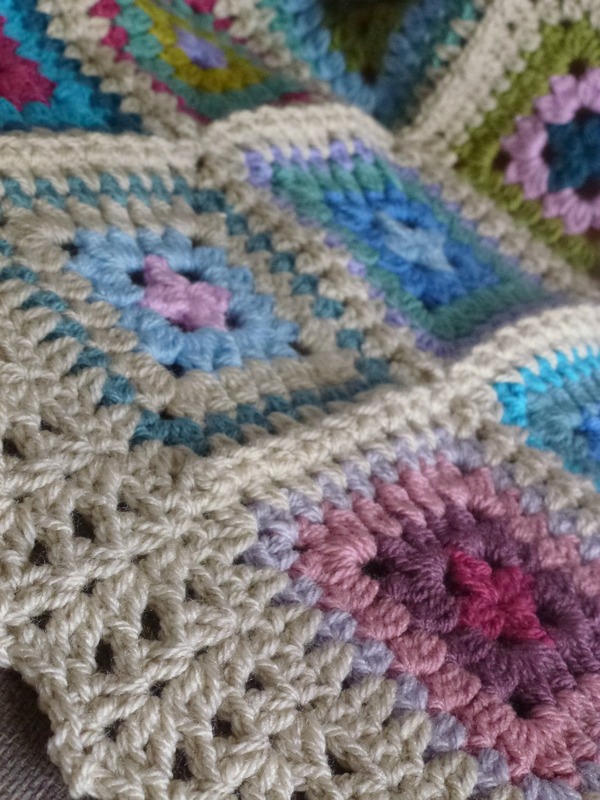 A Super Quick Granny Square Blanket. This is my Itchy Fingers blanket. Between more purposeful projects I still want to have something on the go otherwise I get itchy fingers. Also, I want to experiment with what I’ve got and see if clashy colours go together, stuff like that. I’ve got a ridiculous amount of Stylecraft Special hidden in the cupboard under the stairs. I am determined to get this down to whatever might be seen as an acceptable minimum. Just enough so I don’t get totally embarrassed when people see the mounds of yarn stuffed in that small space. I’ve no idea why I had half these colours. Some of them are particularly lurid. Or maybe it’s just the specific combo I’ve forced them into. Denim and Plum look lovely most of the time but I have managed to recreate the colour palette of a 1970’s vomitty shag pile. Actually, I quite like it. I turned it at each round to stop the twist. I am not sure how I feel about mixing wrong sides with right. 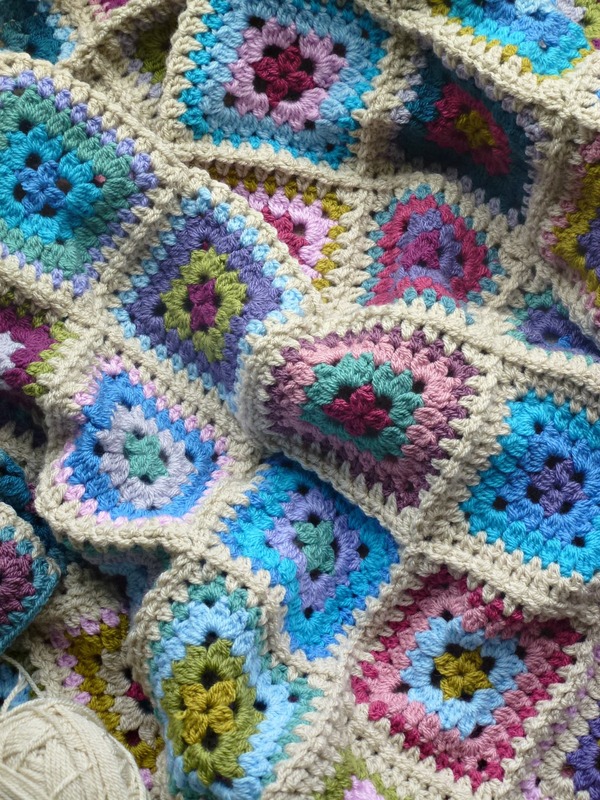 I am quite discriminating about the wrong side of crochet being on display but people who don’t crochet don’t seem to notice that there are right/wrong sides. I guess I should let that particular misgiving go. It didn’t look so bad. Pomegrante, Aspen, Spice, Denim, Apricot, Plum and Gold. It has gone back in the cupboard under the stairs where it takes up more room than the yarn did. 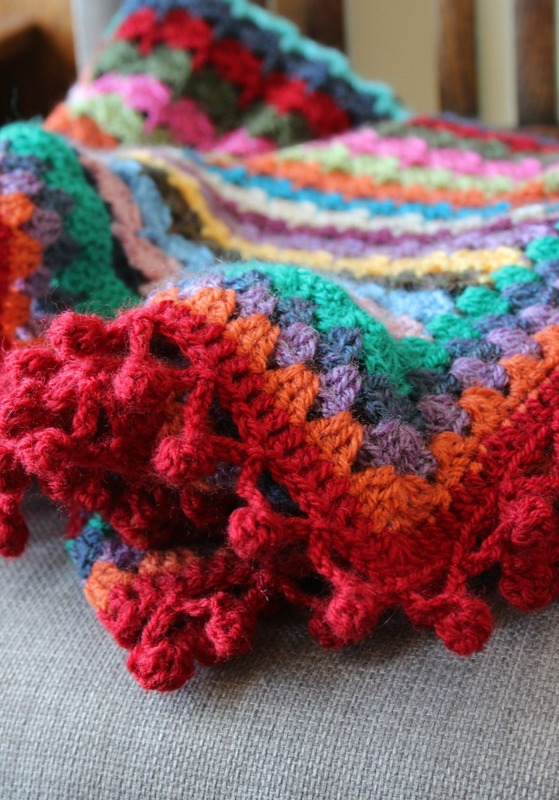 Next up is a basic granny triangle shawl. 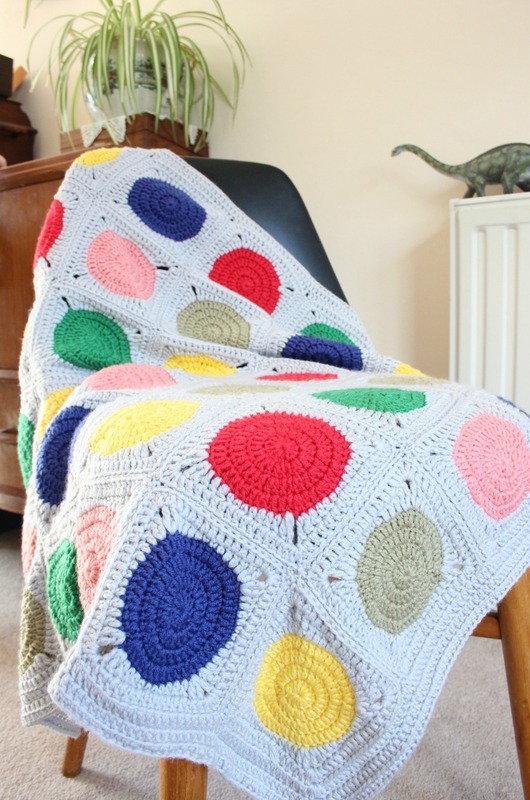 I finished it on Friday but I need to sort out the pattern and write it down. It is super duper warm in this freezing weather. This morning I woke up to a flurry of”likes” on Instagram for the finished article. Brought a smile to my tired 5.40am face. 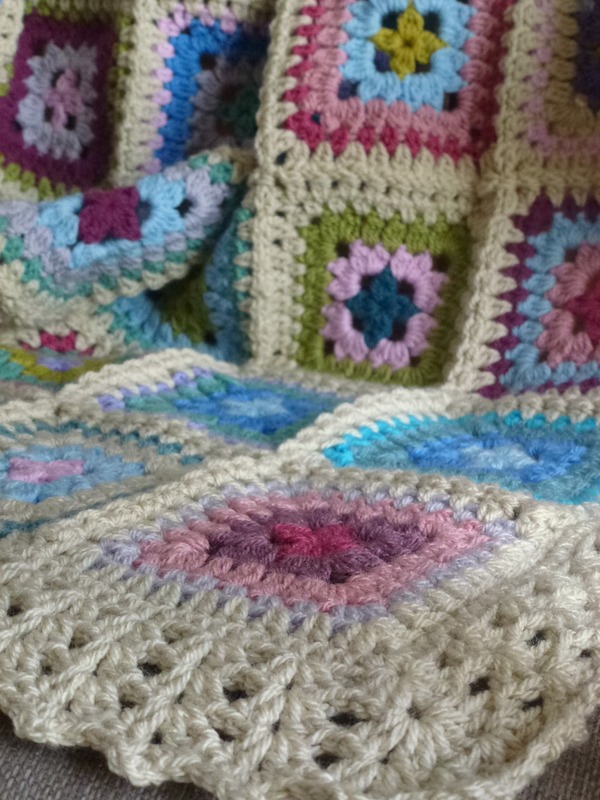 New crochet for January and a finished blanket. 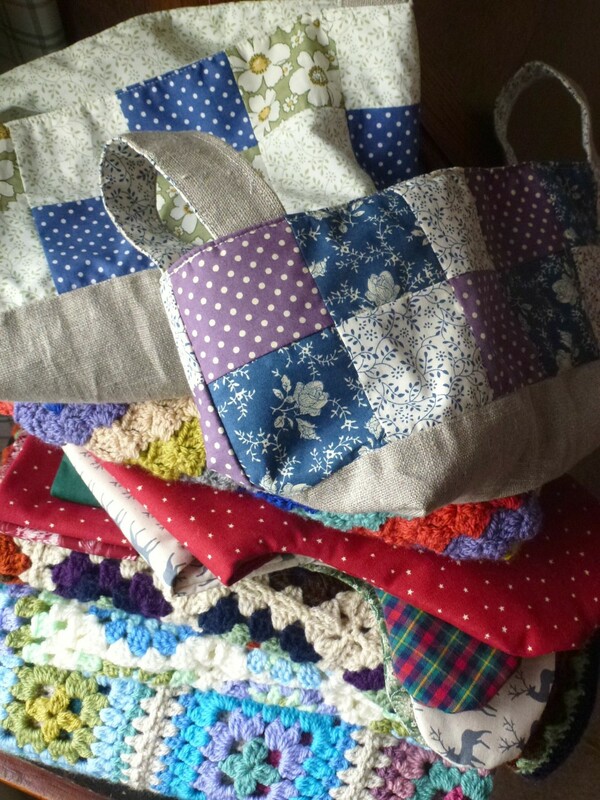 As soon as I’d completed all those Christmas makes I thought maybe I should take a crafty break. I would read all the books I haven’t read because I’ve been doing crochet or sewing. Well, I couldn’t just stop, that would be daft. But I read a book last week and finished one the week before so at least I’ve managed to mix it up a bit. I got a new bag for Christmas! I’ve been saying it’s a jelly bag. I think that’s what they’re called. 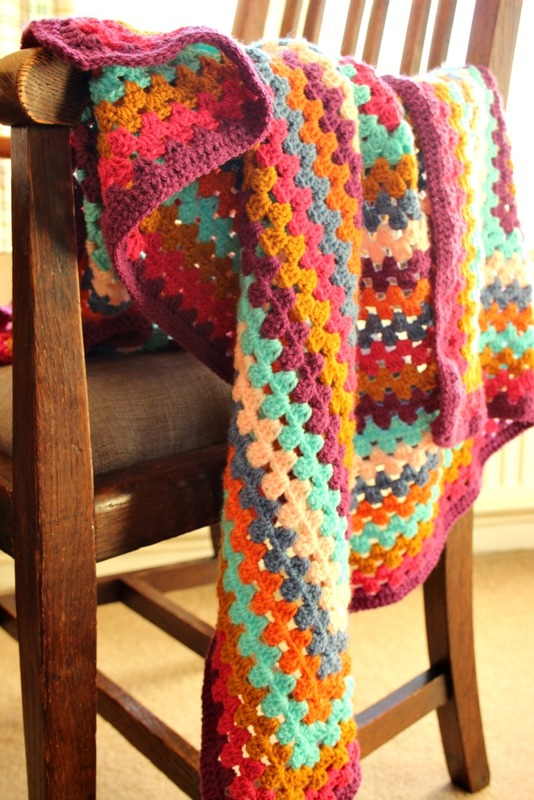 It’s no good for crochet hooks but it looks good. I had one when I was little. I probably had several when I was little. There might have been a sky blue one. My new one is holding my latest project. 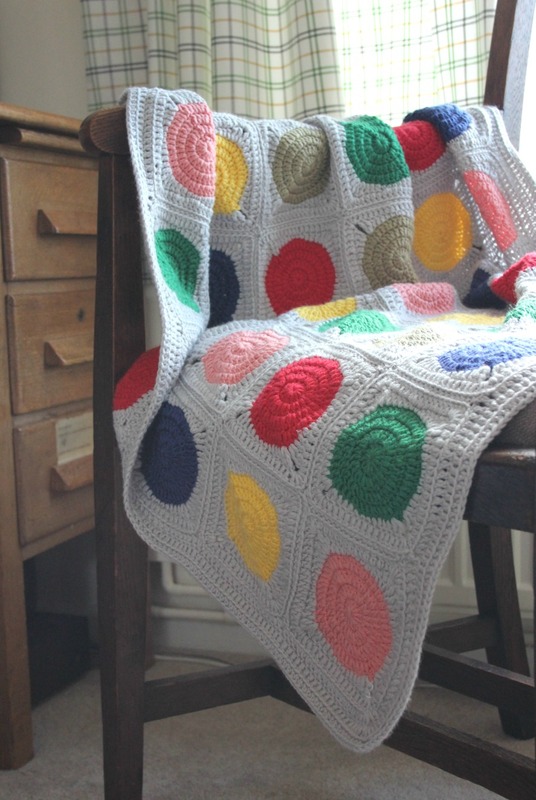 A bog standard granny square blanket. 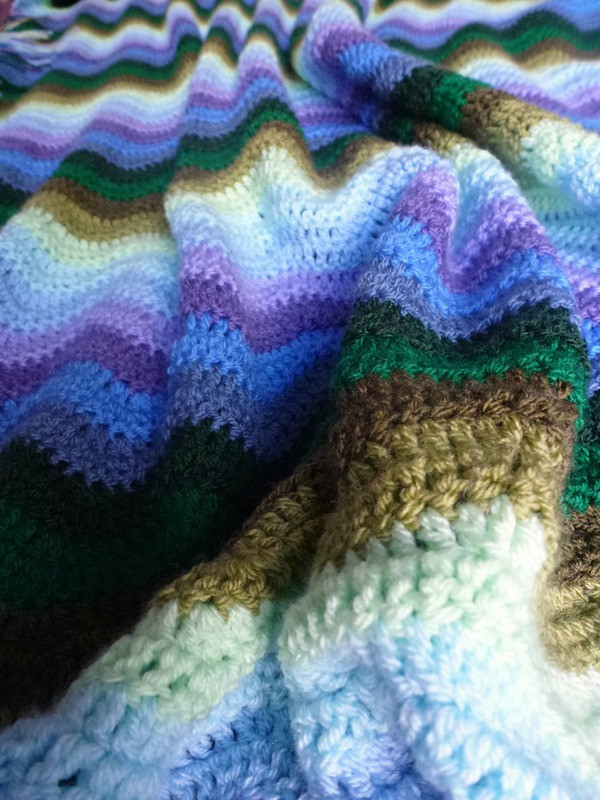 It’s one of many recent baby blankets that is helping to use up my stash. The colours are an odd mix but hopefully someone will like them together. 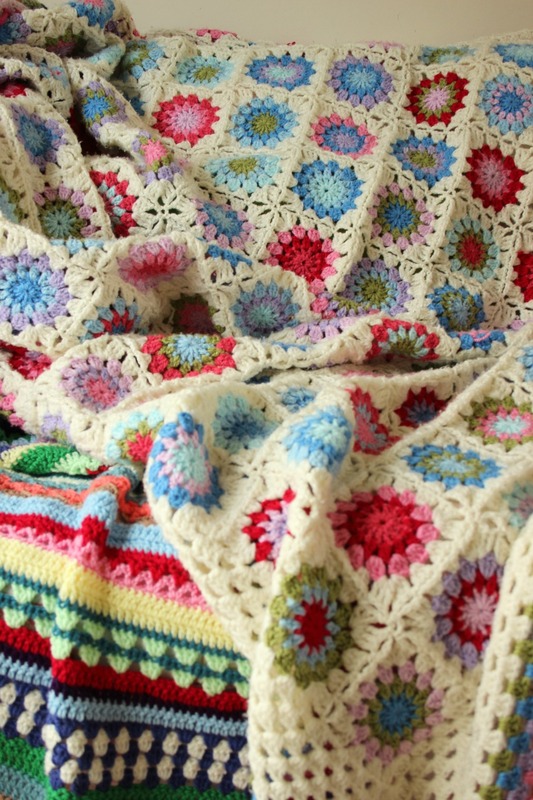 Once I’ve finished the big granny square I will be moving on to a shawl. Nothing fancy, I’m thinking a plain granny triangle. 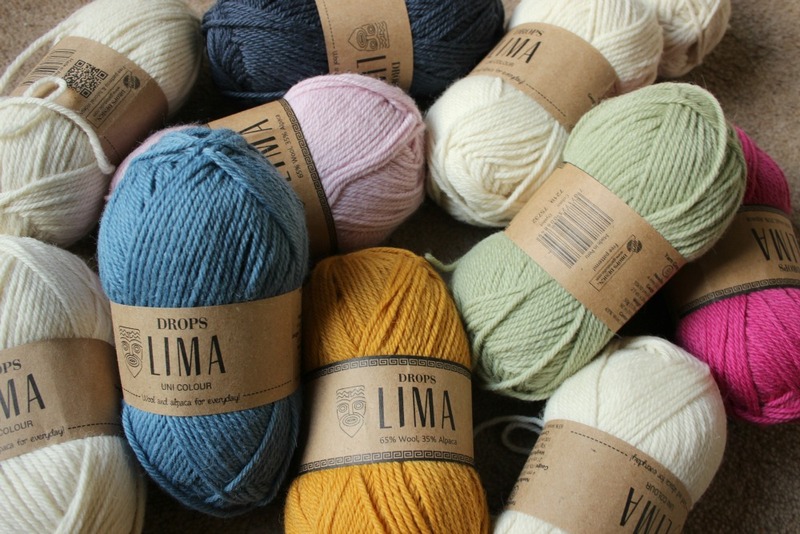 I’ve got Drops Lima, which I think is the DK version of Drops Nepal. The colours and feel are very similar. I bought it because it was on sale. 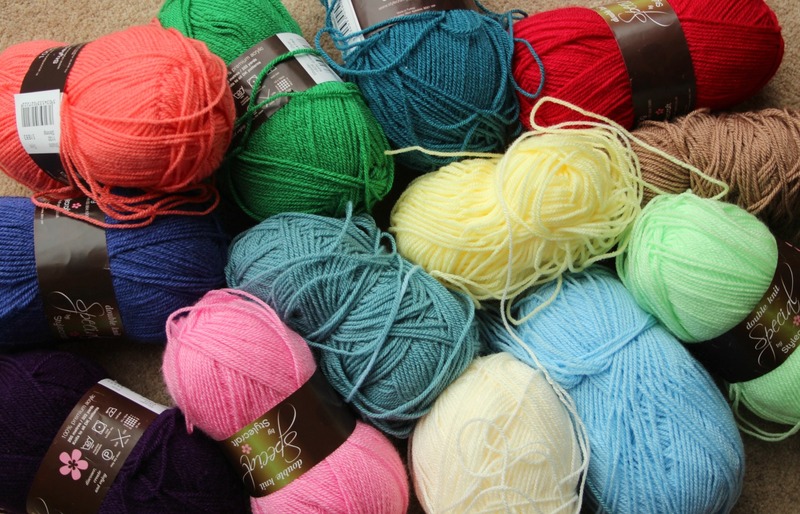 I’ve also gathered what I need to make a Spice of Life blanket. I’m going to use Stylecraft Special and I’ve tried to match the colours of the Rico stuff that is used in the original pattern. Mostly I had this hidden in the cupboard already. I’m getting concerned about how much surplus wool I have (at least I’m trying to reduce it). 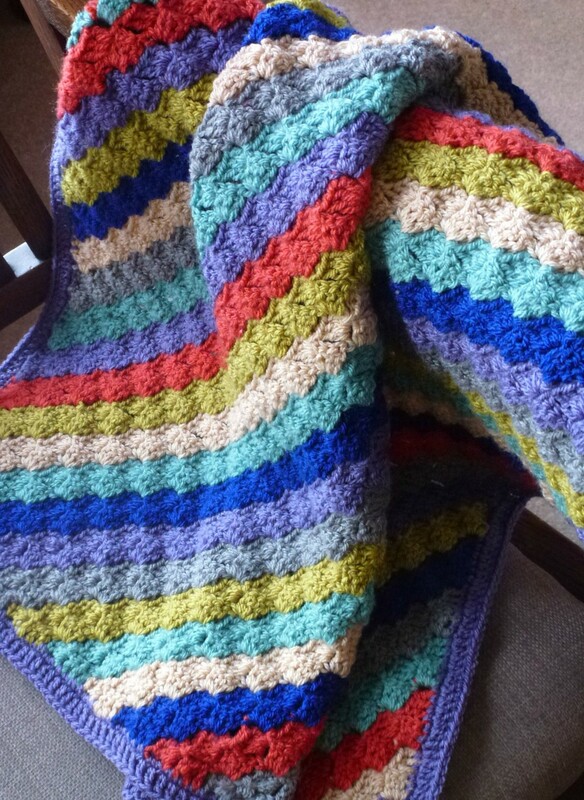 I finished a different blanket at some point after Christmas. 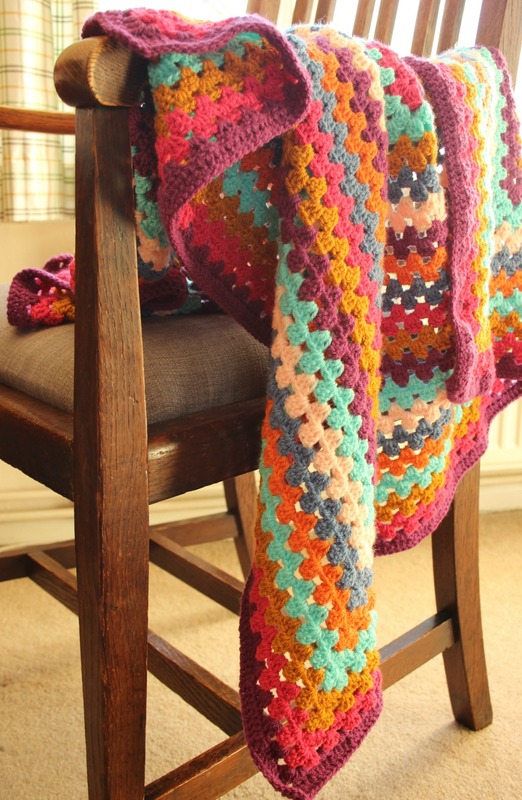 A corner to corner blanket. 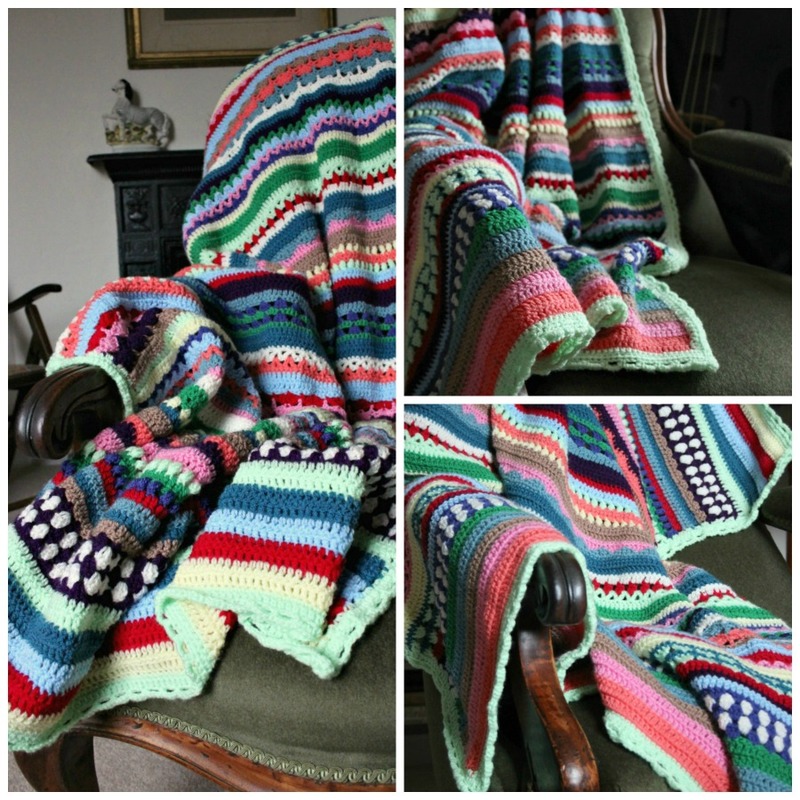 I just googled Corner to Corner crochet blanket and chose a free Ravelry download. 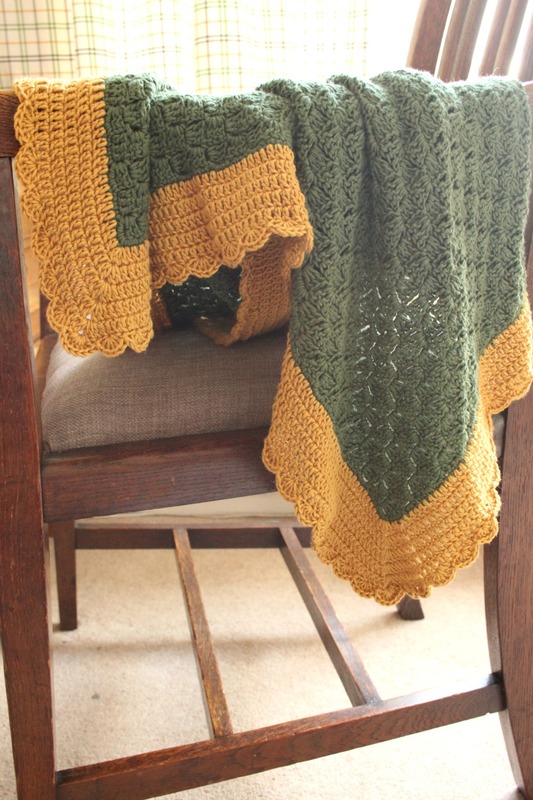 I used Sirdar Snuggly Baby Bamboo DK in Pixie green and a mustard colour which doesn’t have a name on the label. This stuff does not go far, so once the green was gone I needed to add the big mustard border to get it to a decent size. 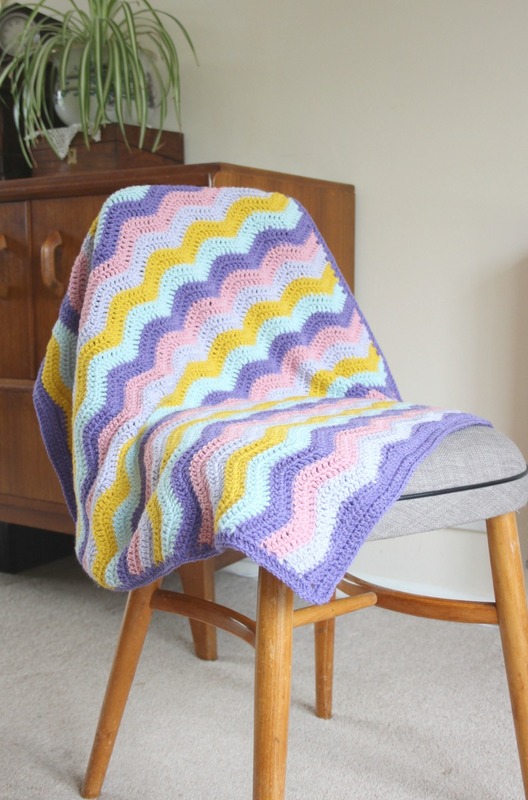 Originally it was going to be two baby blankets, now it’s one! I had enough green to add (UK) dc’s all the way around the edge to create a neat foundation for the border. The border is just a load of (UK) trebles and a scalloped edge. Each scallop has 5 trbs with 7trbs for the corners. It’s very drapey and got a good weight to it. I really quite like it. 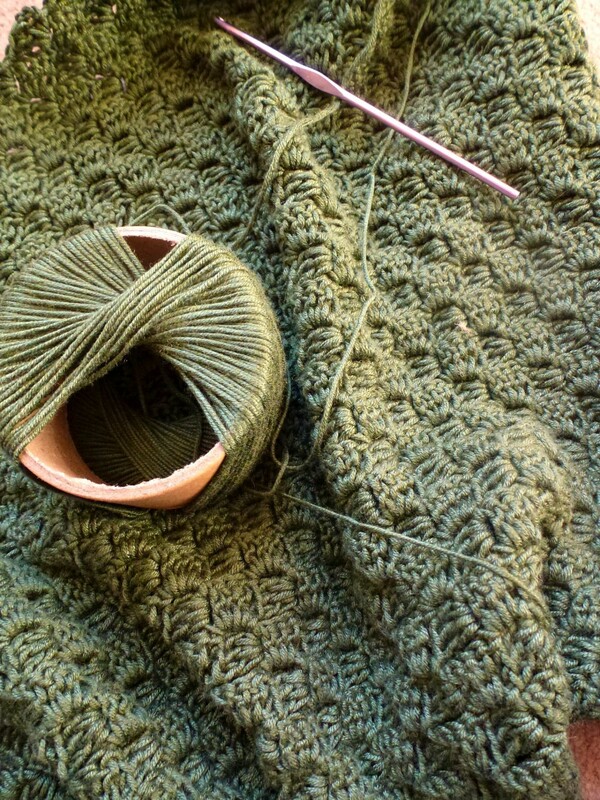 Lastly, for the rest of this week there is a chance that I might also try and remember how to knit. It hasn’t gone well so far. I can’t remember if I ever knew how to actually cast on. 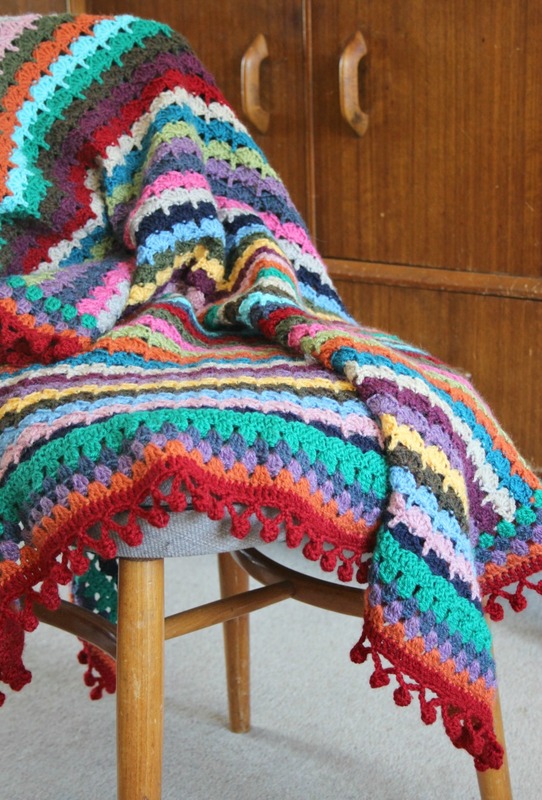 I think Nanna always did that for me and then would pass me the needles to do the rest. I should sort that out. It’s properly December now and the time I thought I had is pretty much gone. I had lots of ideas for Christmas makes but I have gradually knocked certain things off the list as time disappears. I’ve narrowed it down and there are three main things still left to finish. Anything else I make after that is a bonus. The first is the thingy above. I started yesterday and it was fun to get cracking. I love the colours. It is Drops Nepal, an alpaca mix aran. I will be sure to take some more pictures of this later. I think I will finish this quite quickly. It’s an enjoyable thing. 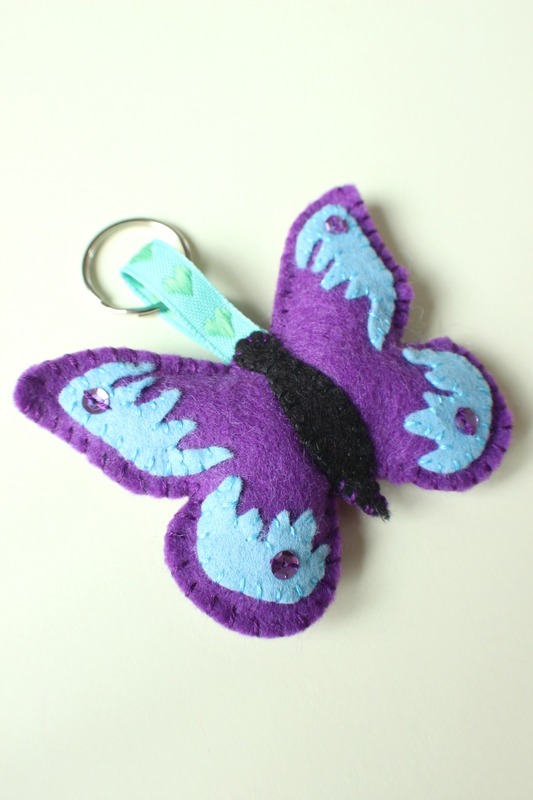 This is the stuff that I made thinking I would try and sell it at the craft fair last month. I also knew that if I didn’t sell it then I would be giving some of it away as Christmas presents. Is that wrong? Feel marginally guilty but can’t put my finger on why. This is my first Corner2Corner and my first Walking Dead blanket. Called the Walking Dead blanket because I need somewhere to look when the zombies/walkers/biters are on screen. It’s only small and made from leftovers, hence the odd colour choices. They are not my colours but I think they have some appeal. Autumnal. This is the second Walking Dead blanket, started when we began season three. Still not finished but we have three episodes left so the two should be finished together. It is made from Bamboo. I bought it for £1.39 a ball, reduced from £4. Unfortunately, it smells rank. I’m not sure if it’s the yarn or the cardboard inner wotsit. It has a very specific wet chopping board smell. Hopefully a good wash will sort it out. It’s very silky feeling even if it is stinky. And it is not bogey green either but a beautiful emerald green. Camera does not do green. I’m also about to embark on the final version of a dolly. This is a special request from my niece. I worked up a prototype yesterday. After making some tweaks, it is probably what I should finish off first. I don’t take the easy road, I have drafted the pattern myself, which is something I have no real experience in. I make stuff up as I go along. We shall see. 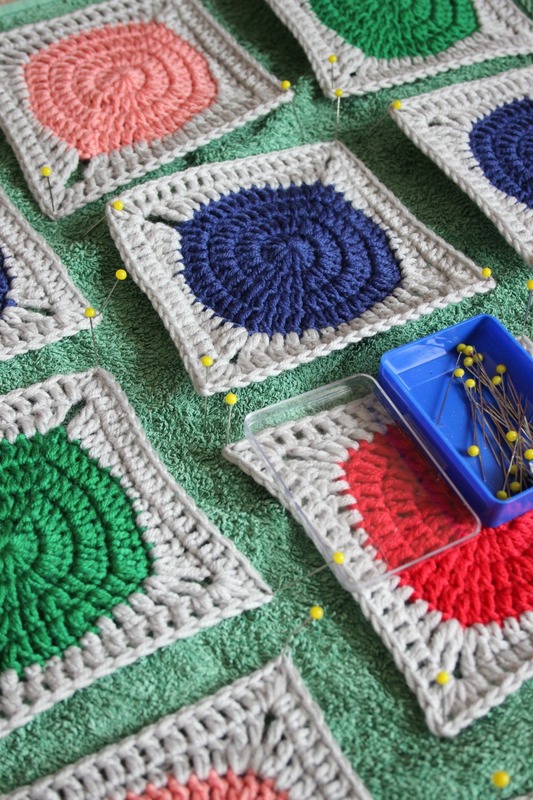 I have another crochet project that I’m putting off as I know it’ll be tricky. It’s an amigurumi job and it’ll be in black and white. But that is the third and final thing. This is what me and Eldest are working on after school. He traced around one of my gingerbread men templates and cut it out. 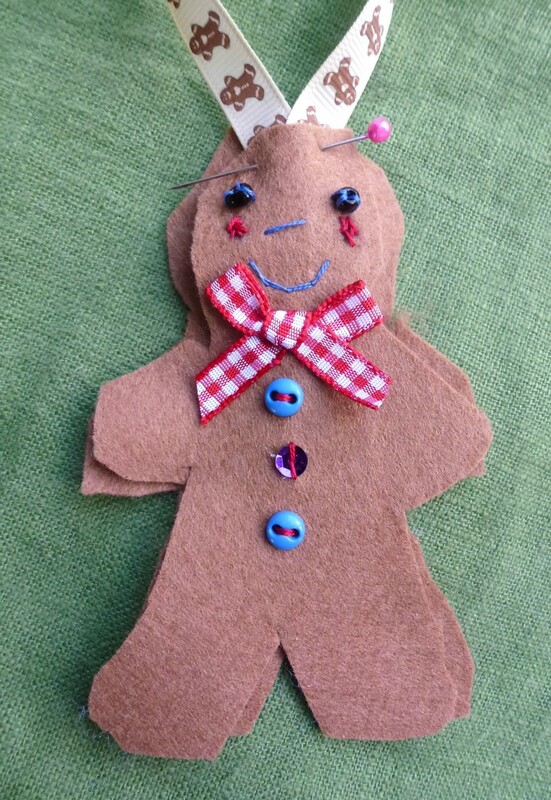 He chose the buttons and stitched on the nose and cheeks himself. I expect him to stitch the two parts together too. I’m looking forward to seeing it on the tree. Sooo, that is where I am and I am getting further behind by tippytappying here. I’m off to see what I can do in the next 45 minutes before I have to wake up Toddler and rush off to the school Nativity! 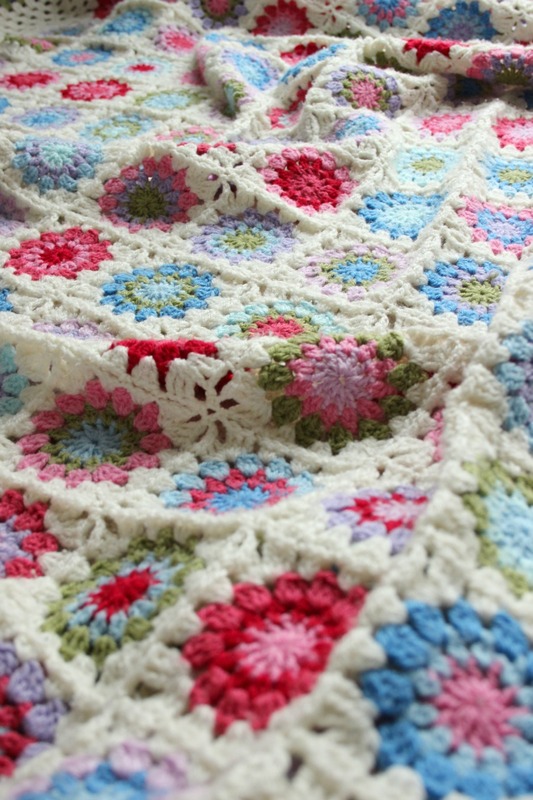 The Petal Patch Harmony Blanket. Decide to get out a woolly blanket and the cat will appear from nowhere. Trying to take pictures of a woolly blanket is even worse. 70% of the pictures I took of this blanket had cat in them. I eventually gave up. I’ve put it somewhere safe in case she tries it on again. She has claimed too many of my blankets. 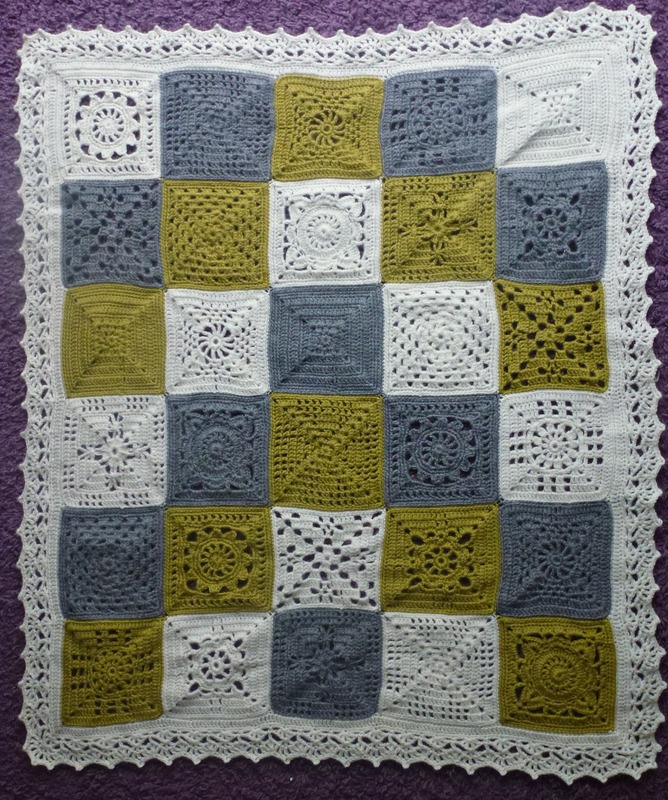 I really enjoyed making the squares. 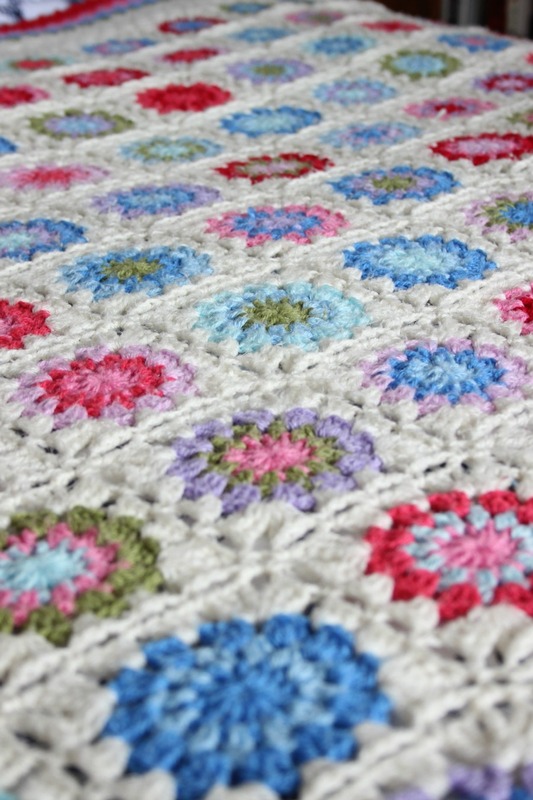 They are the Petal Patch Motif by Betsy Makes and the colour scheme is basically nicked from Attic 24’s Harmony blanket plus a few balls of Parchment and a smattering of Grape (it’s all Stylecraft Special DK). 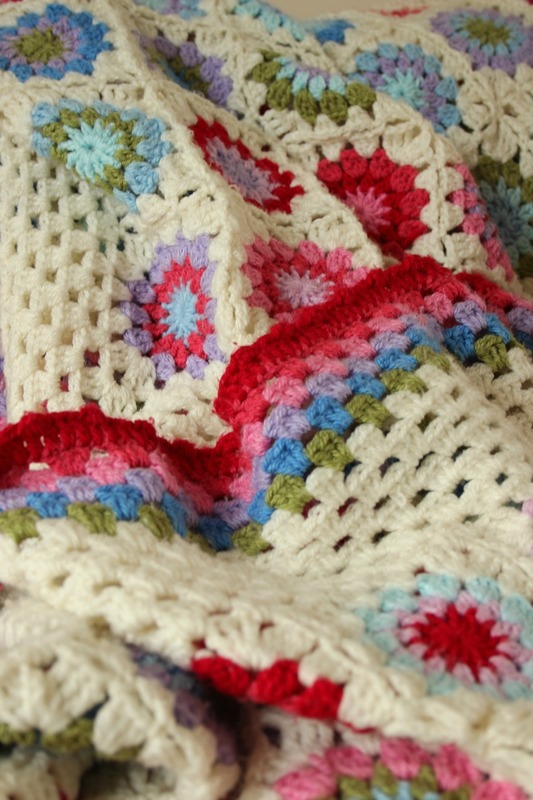 To give a nod to both of these pilferings I am calling the blanket Petal Patch Harmony. Blankets have names these days. It’s slightly squashed where the cat abused it. I should probably give it a wash before trying to put it up for sale. Many of these pictures are very samey but it takes too much time, dithering about which ones to use. May as well use them all. Once again, I used the Continuous Join As You Go. Next time I’ll move on to a new technique. Not because I don’t like this one (I actually really like it) but because I want to learn something new. I’ve seen a few different ones about that I want to try. Just need to decide which to do first. It’s a good size for the sofa or maybe a toddler bed. It also works well draped, with nonchalance, over a chair. Perhaps I should aim for one blanket per item of furniture; I can casually arrange blankets everywhere. You’ll never find the cat again. 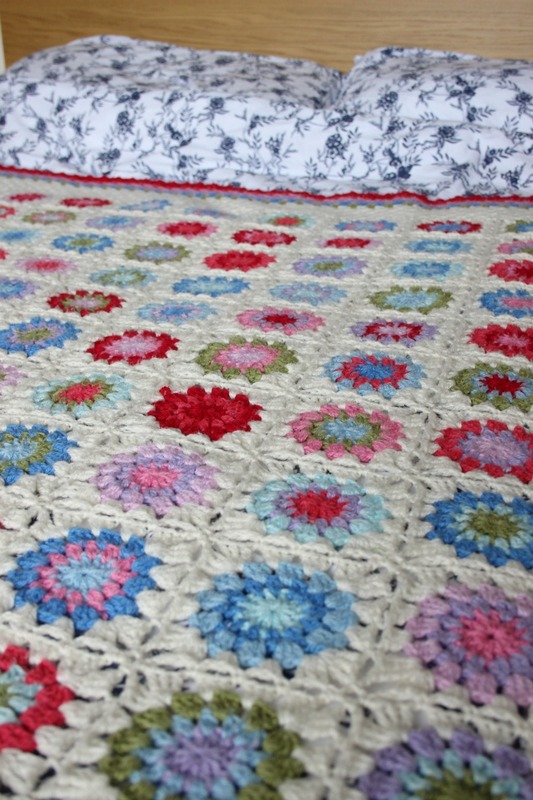 The border is from Edie Eckman’s Around the Corner, Crochet Borders. Number 27. I cheated and skipped every two stitches, not every other. I did it that way so I wouldn’t have to make as many stitches. I can see that it is a ever so slightly stretched but that’s the punishment I get for being cheaty. 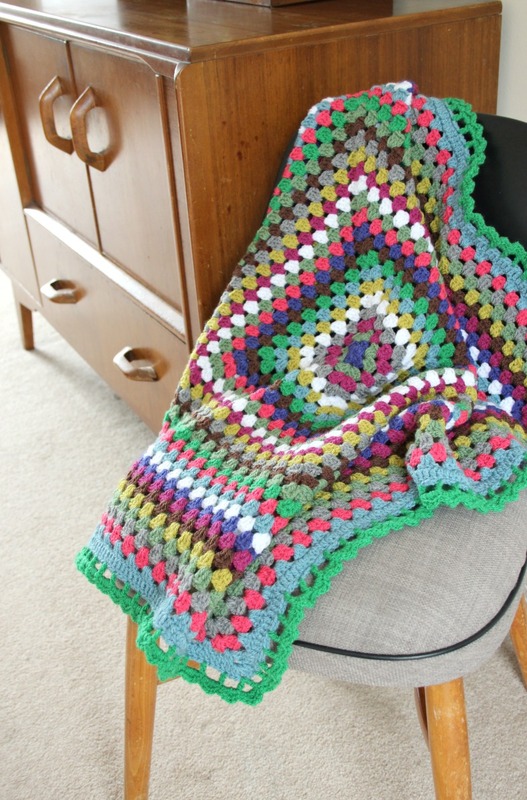 I did the same thing on the Fireplace blanket and got a way with it more because I tinkered with the pattern. I get told off a lot for not following the recipe. Here it is, complete. It looks smaller here than in real life. Real life tells me it measures 95x125cm. 63 squares. Main colour is parchment and I can’t remember if I used three or four balls. The rest of the colours are most definitely less than a ball each. I used: clematis, lavender, lime, meadow, plum, sage, storm, pale rose, turquoise, violet, cloud, petrol, grape, raspberry, parma and aster. Hope I haven’t missed any out… Right, onto the next project! 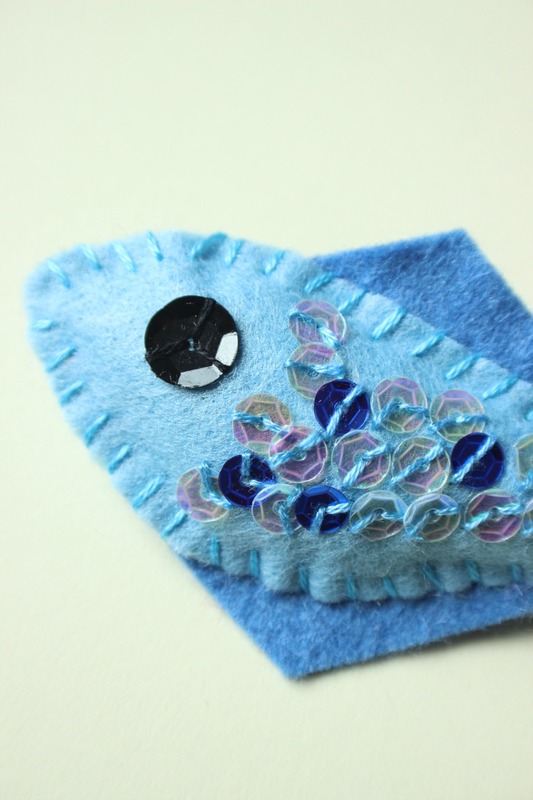 I made stuff pre-blog too; pretending to be a crafting blogger. When you’re not. Yet. I’ve spent years being inspired by other bloggers work. It became something I really wanted to do too. It looked fun and it looked like a good way to keep on track of what I was doing creatively. I was lazy and procrastinatey and used several excellent excuses as to why I hadn’t just done it. I’m still so new to it all, but if I had started when I first I had the notion then I would have been being bloggy for six or seven years by now! In my head, I have been doing it for six years or seven years. I’ve spent much time taking pictures of crafty projects and each time I’ve thought that maybe they would end up as a blog post. So, I’m going to put up some pictures of work that was done in the six months prior to hitting Publish for the first time. (I was going to write a post about yeasterday’s [relevant unwitting typo, that applies] kitchen endeavours but that was such a disaster that I need a few days to recover :/). I went through a mandala phase. These two are both Made in K Town using Rico Creative Cotton. 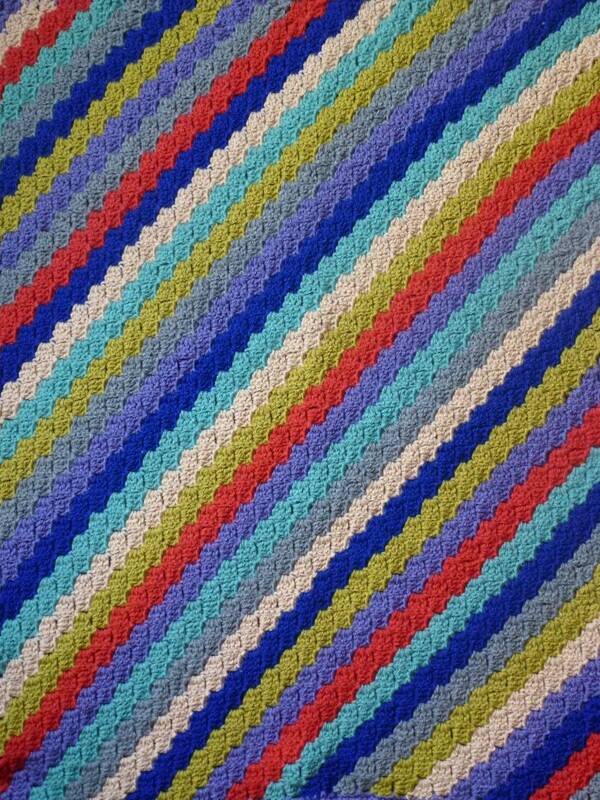 Cheap cotton, very splitty, lovely colours. 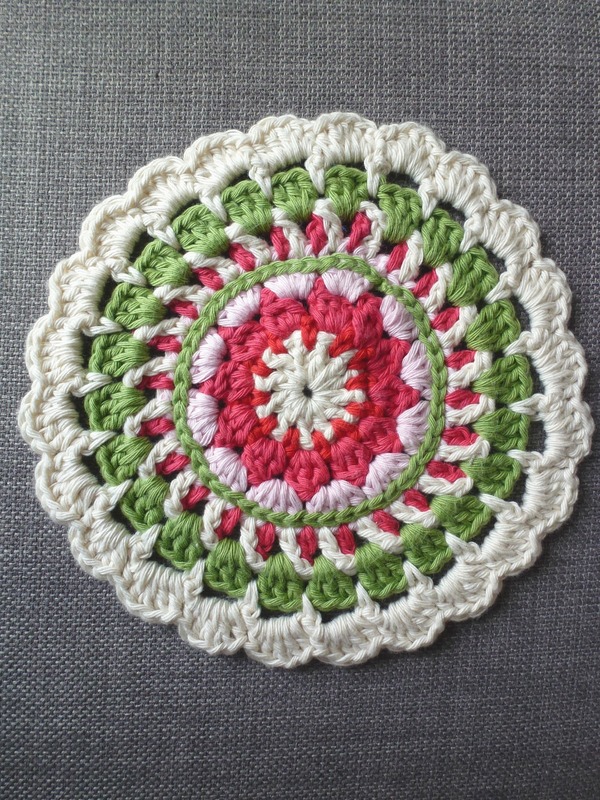 This has led me towards doilies, which I still need to make more of. Soon. I made my eldest boy an Attic 24 Ripple for his bed. It’s Stylecraft Special. 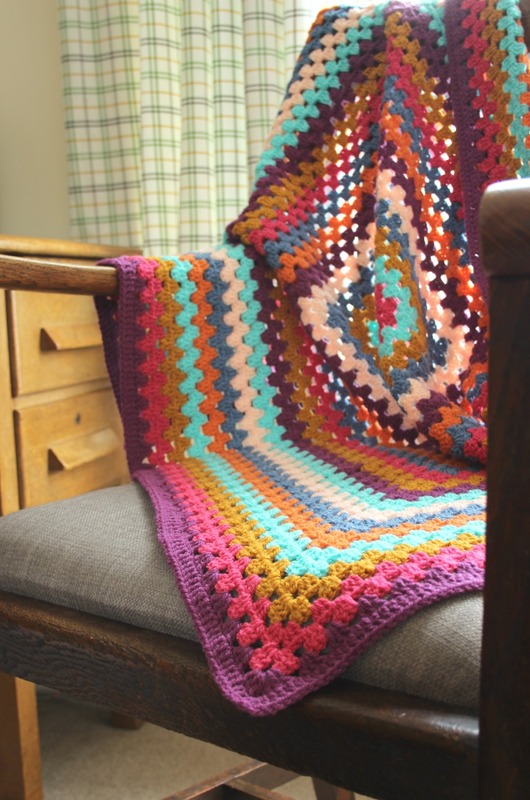 Everyone loves a bit of Stylecraft rippling. The boy chose the colours. So off I went. It was reasonably speedy once the first few rows were out the way. A repeating colour pattern was a weeny bit boring though. Next time, it’s random colours, like it’s supposed to be. I made teeny niece the mini version for her dolly. I didn’t use the same pattern. This version has more ripples so looks better scaled down. 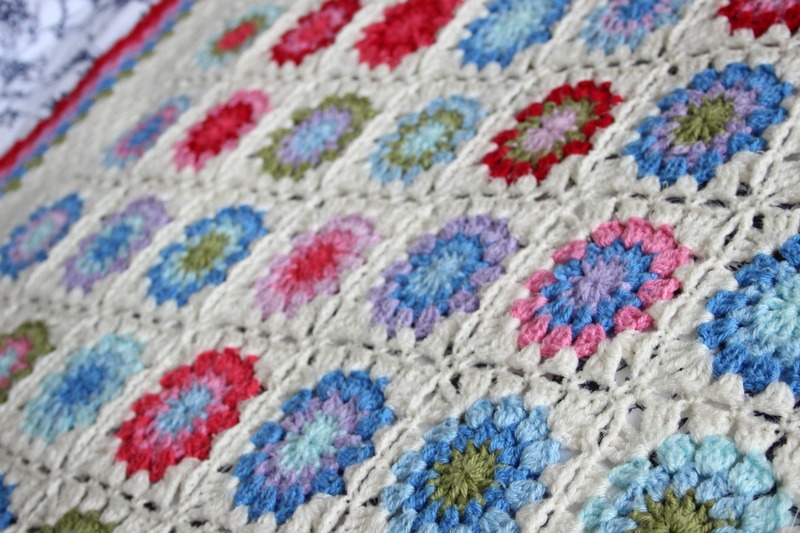 It’s actually adapted from a cushion cover pattern from Cute and Easy Crochet by Nicki Trench. When I say “adapted” I mean “added a few more rows”. 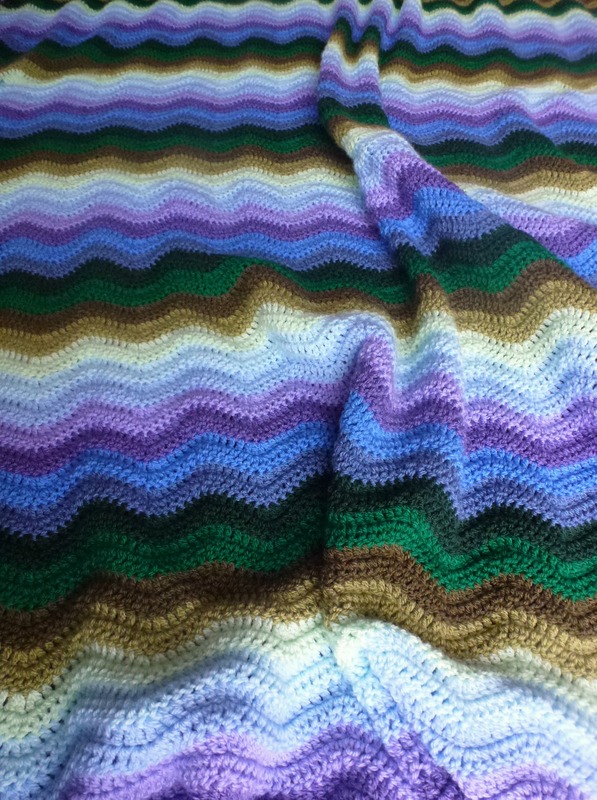 The edging, I think is the one that was on the Granny Stripe made by Lucy at Attic 24. 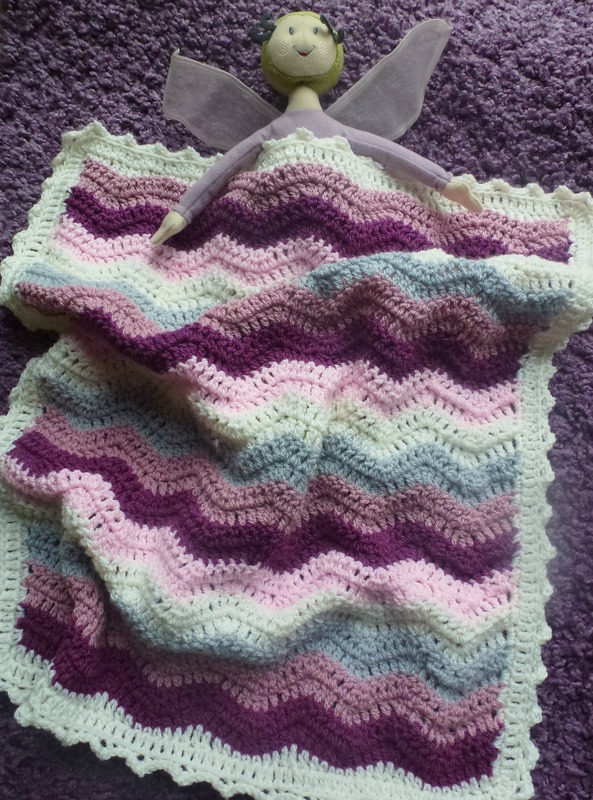 This one was a special request for a baby blanket. My Sister in Law chose the colours. It’s Stylecraft alpaca DK. 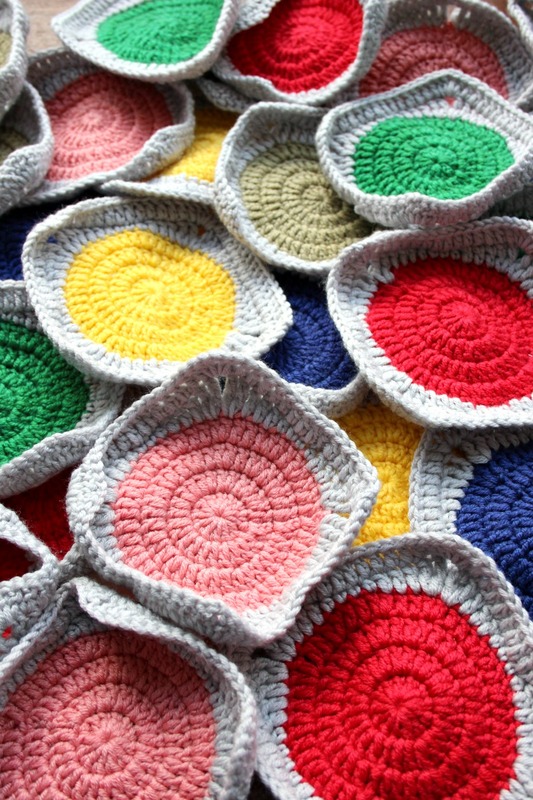 The blocks were from 200 Crochet Blocks by Jan Eaton. 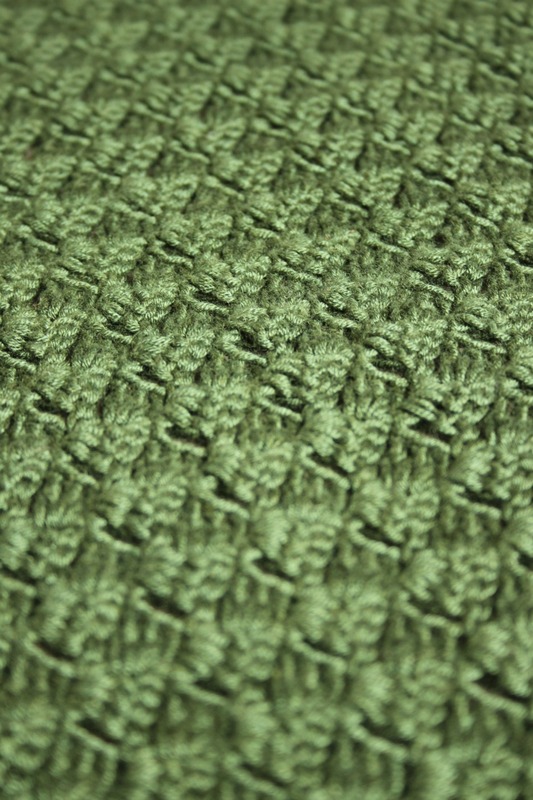 Don’t go thinking that all the blocks end with the same stitch count though. They really don’t. Hmm. 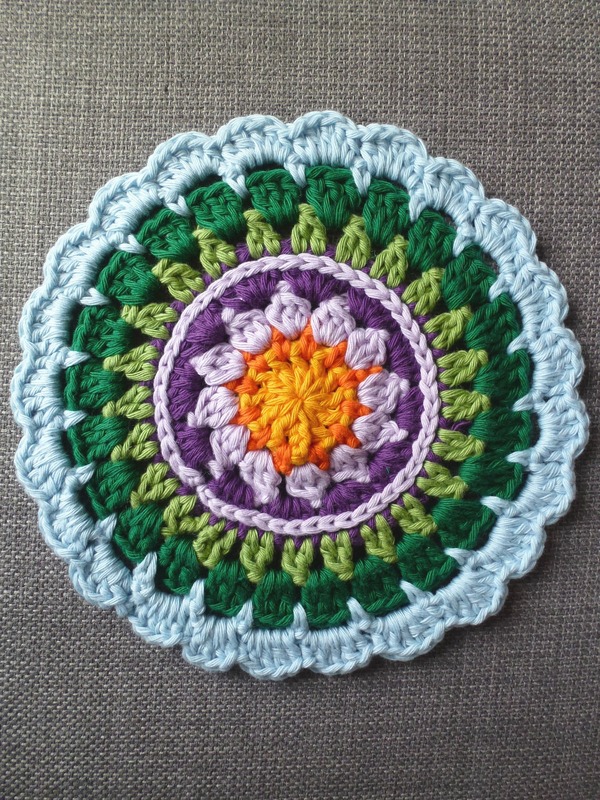 I really liked how this one turned out but I only blocked the edge (which is from Edie Eckman’s Crochet Borders book) and not the individual squares. Next time, I will try super hard to block stuff. 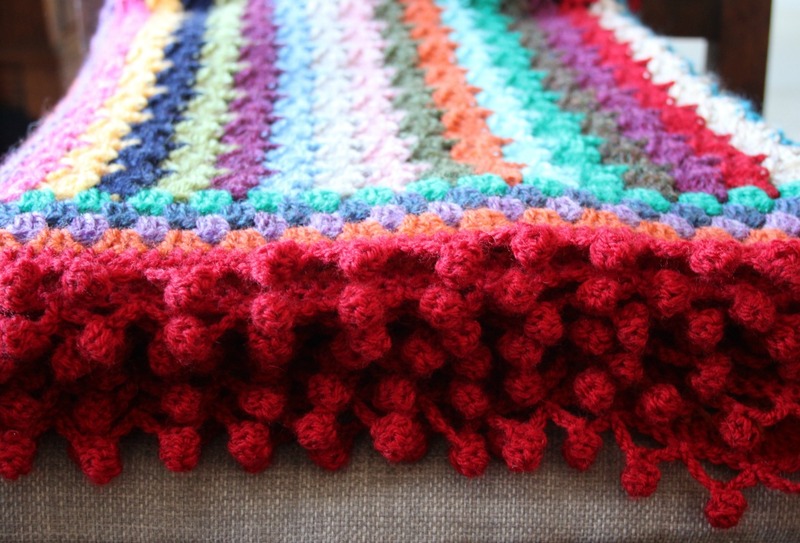 One of the quickest little blankets ever. It was so much fun. 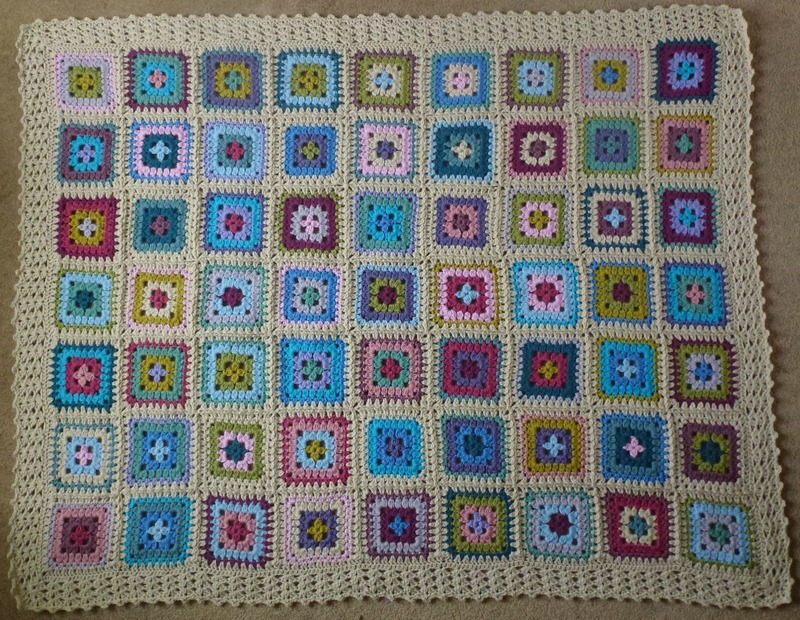 The squares were done in a few days and it was the first time I used a continuous-join-as you-go. 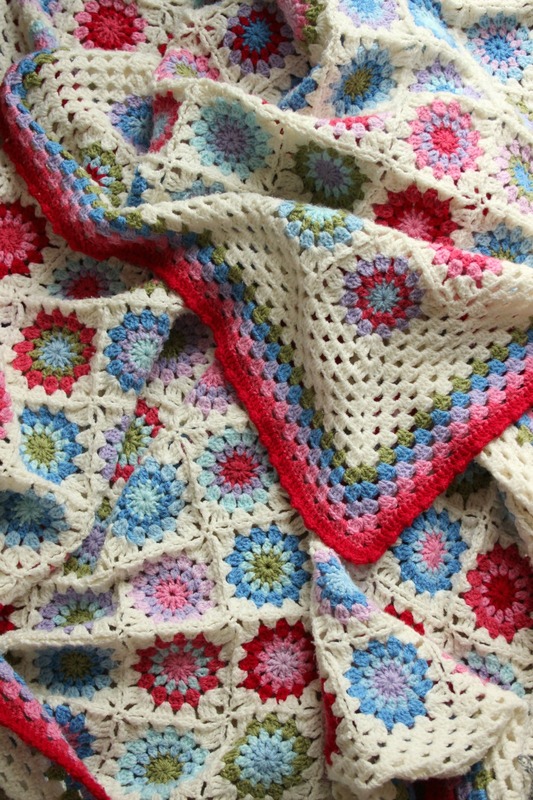 This was for a baby girl born in early spring. I’d make one of these again for sure. It was inspired by a picture I saw on Pinterest and it led me to Katie’s Kitchen. There are six handmade things in the picture above. Six! 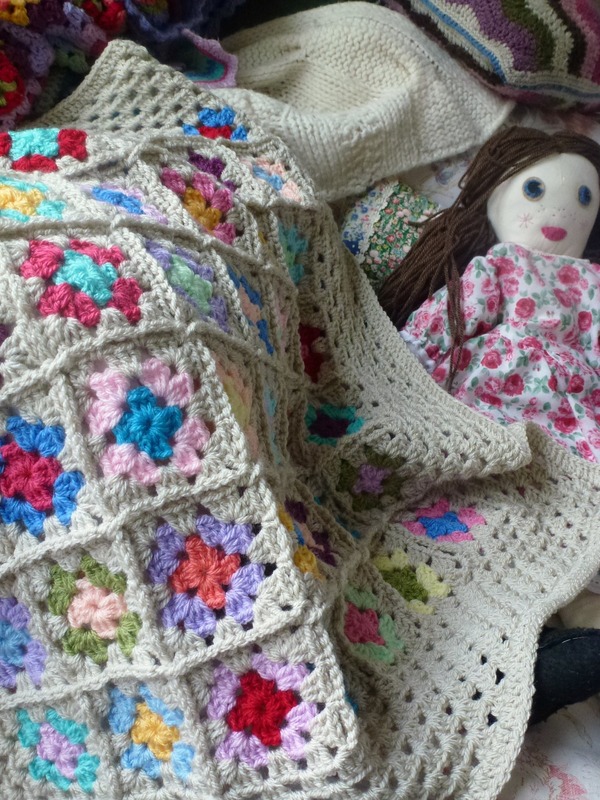 I am responsible for five of them but the cream knitted blanket is a Mother in Law job. Three blankets, two cushions and a dolly. Huzzah. 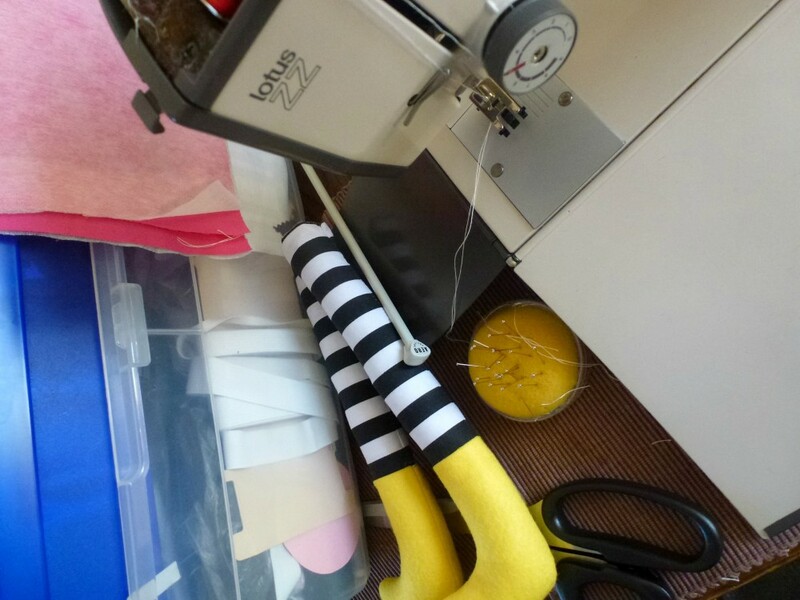 Sewing has been worked on too. I’m better than I was but there is definitely room for improvement too. 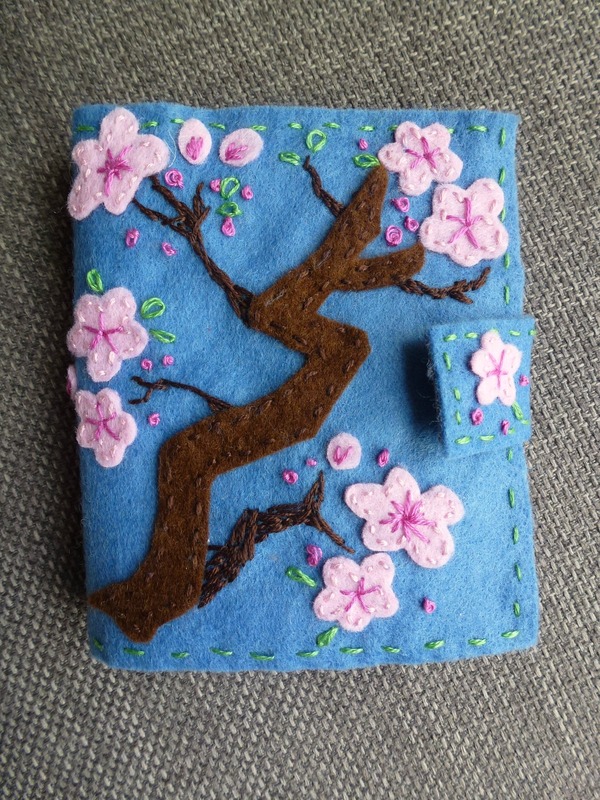 Having said that, the cherry blossom needlecase is one of my favourite felty sewn things I’ve done. 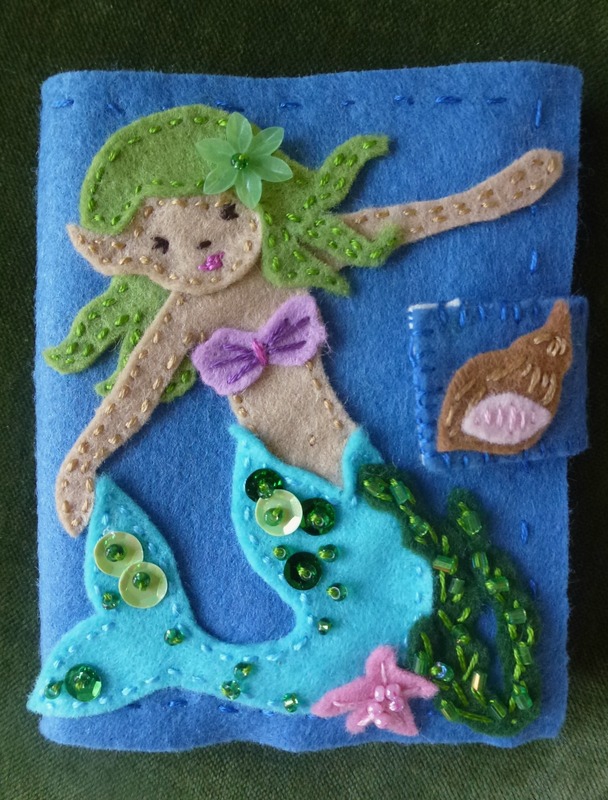 And a Mermaid’s purse! 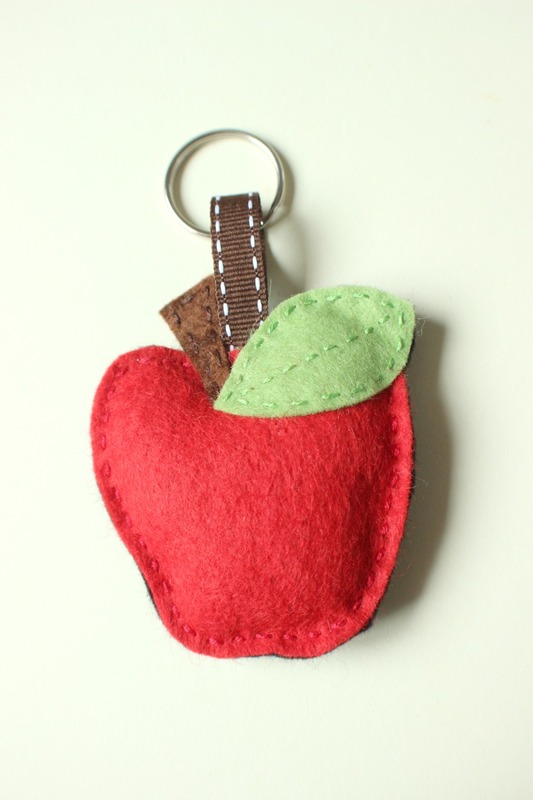 Well, another needlecase… She was lovely to make. 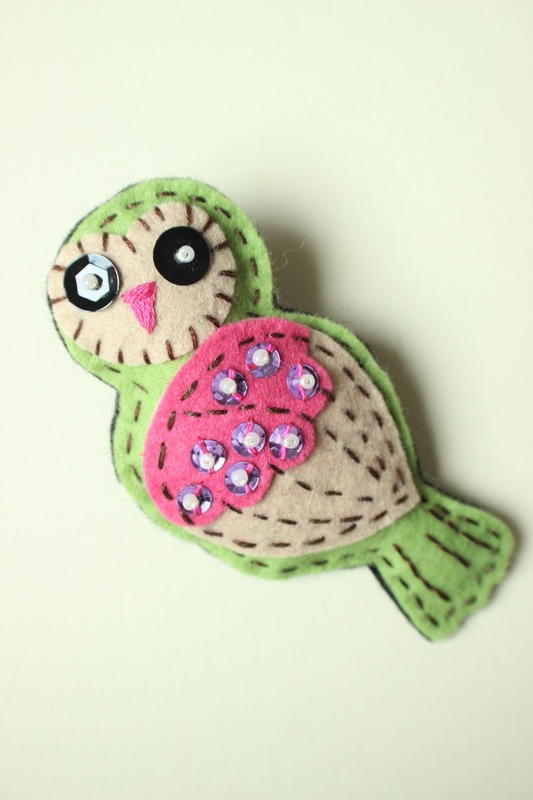 After Christmas I plan on making more of these sorts of things and giving them a go on Etsy. I’m not entirely sure what the demand is for needlecases and such, I guess I’ll find out. I will obviously shout very loudly on here if these sorts of things head towards my Etsy shop. Phew, I feel a bit better now. I’m off to have yesterdays’ leftovers for lunch, which thankfully, taste better than the experience that I had in the kitchen.